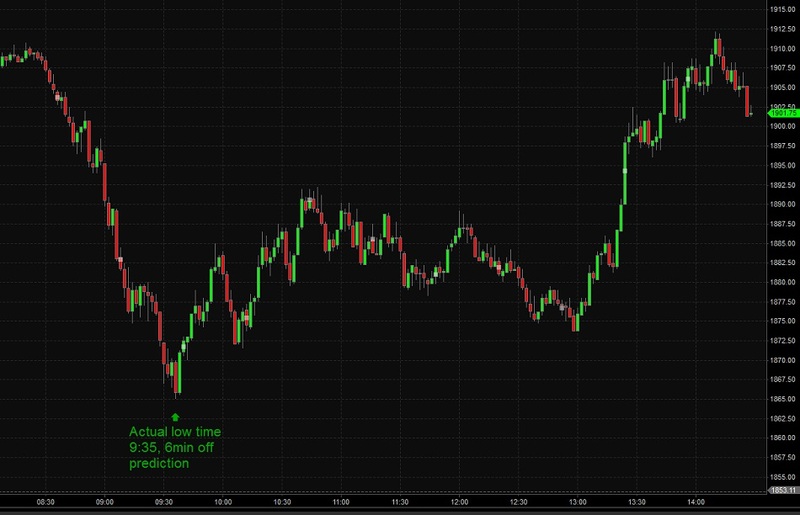 Update- though we haven’t had much time to post recently, we have expanded the examples below to include Day Divination, Minor Arcana pullback times, and range predictions (top to bottom), in addition to turn times and price projections. Very simple- just cut and pasted the chat transcripts making the calls well before the actual event and the charts below them. 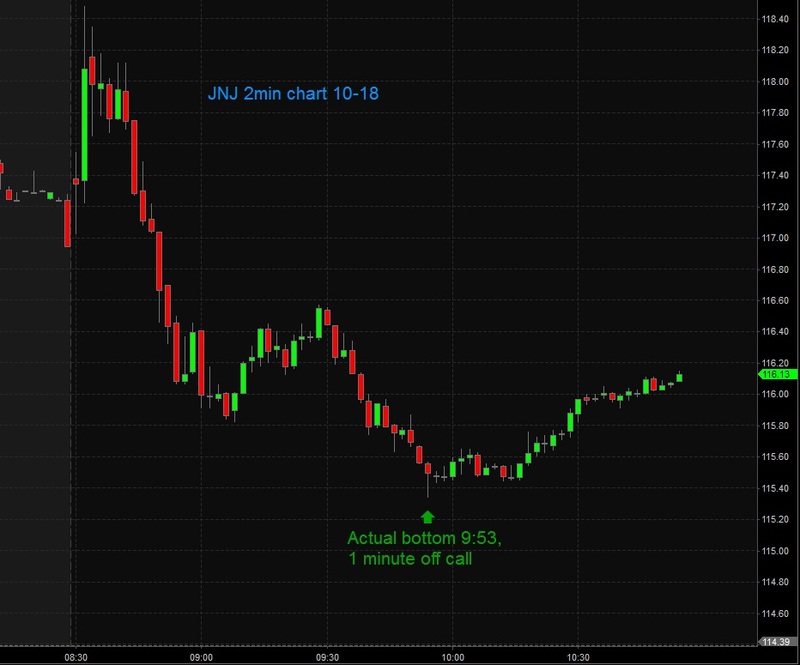 Even though we do this frequently, we do not have time or space to post every call or trade. These setups don’t occur every day, and we mainly post these examples around seminar times so there is some demonstration for those looking forward for the Gann course. DISCLAIMER: We do not have space to post every call we make. One would also look for market confirmation making an outside move around turns times and price predictions to consider them a valid signal. The market occasionally prices “inside” at turns times and in these instances we would label the event no-signal. 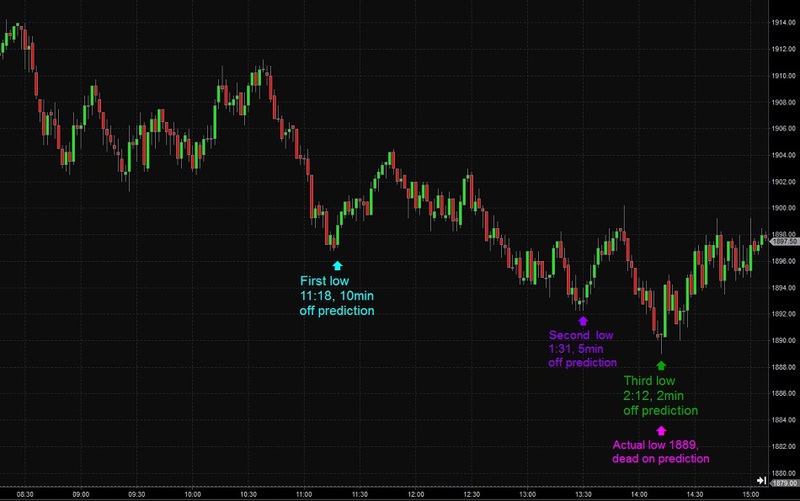 The following examples must be taken as hypothetical illustration of analysis techniques and not actual trade results, not representative of actual account results. Forgive the sizing and cut-and-paste nature of the page….we really don’t have time for editing these pics and our webmaster just posts what we give them. Chart source: Wave59. 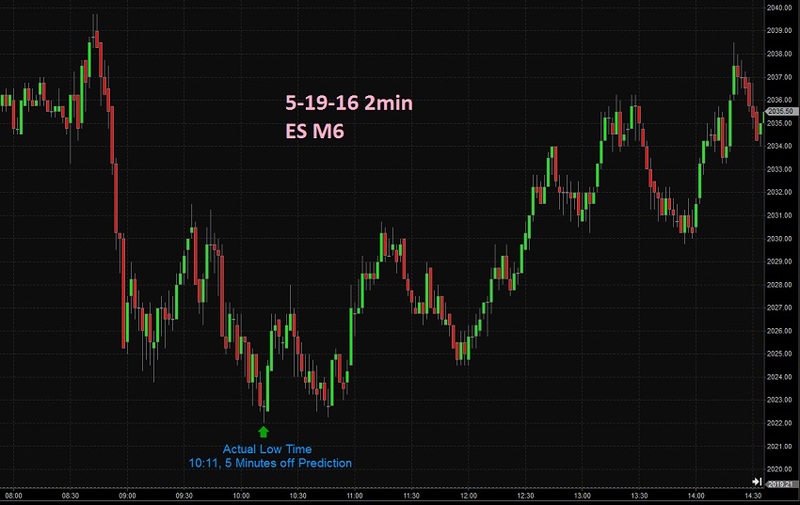 Below are a couple calls demonstrating the “17” Day Divination, Minor Arcana entry to identify an trend-following entry time from a pullback against the trend, and a couple Range Finder calls to identify the increments of markets moves on this particular day. For the sake of demonstration and the fact that we don’t have the time to post that much, we will demonstrate several techniques over different markets. 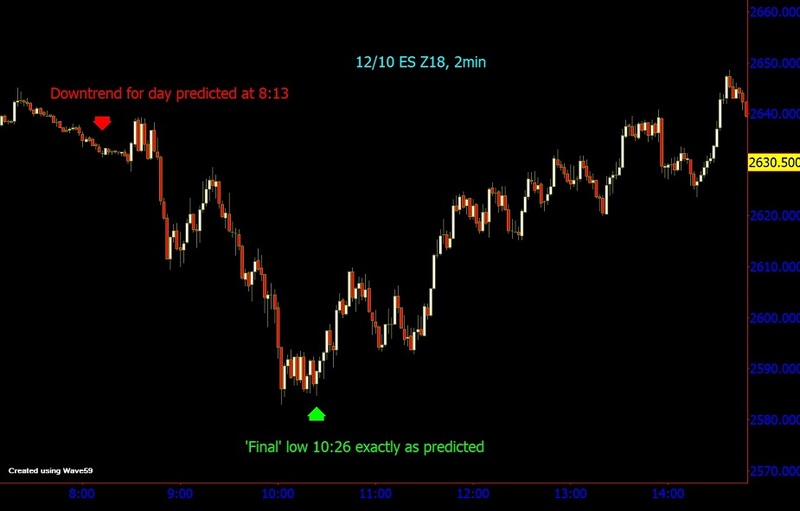 These techniques show intraday examples, but can be done on all timeframes. 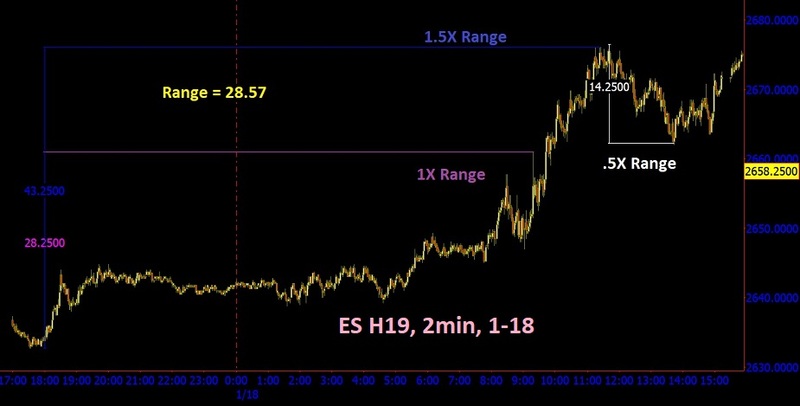 First chart and 2 calls, the range increments (our calculator rounded 27.73 in the room- actual predicted range 28.57 on chart), predicted in advance of the day (posted here in morning) on the ES. Then the trend called by Day Divination “17” early in day. 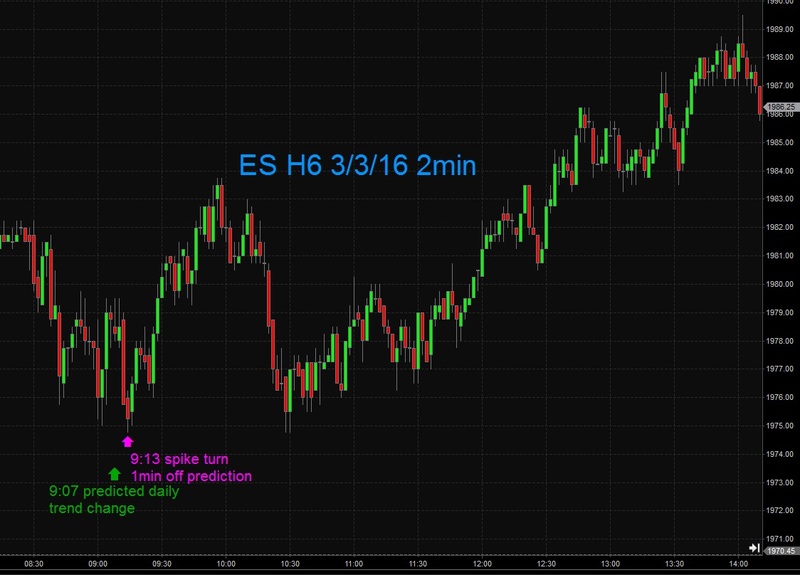 See ES chart below. 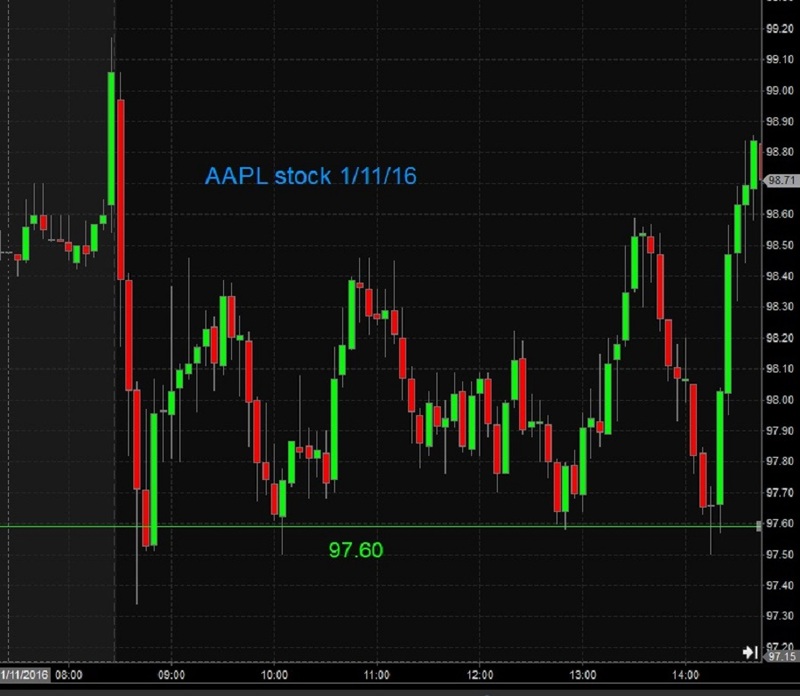 Second call and chart, the exact low price AAPL will bounce off of. 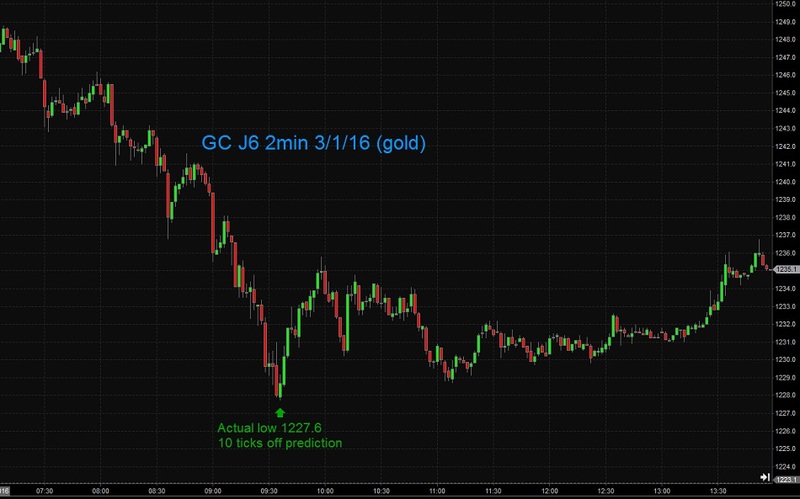 Third call and chart, the exact price gold would pull up to before resuming its trend down. How valuable are these techniques mixed in with your conventional trading approach? The crazy American market is obviously sending a message to the FED as it did in August of 2015- stop the hiking madness. Right now Gann’s indicators tell us to stay out on a daily chart until an extreme down price occurs. But in the mean time the intraday is pretty fun. See below. Today the “17” Day Divination shouted down before the market opened (actually it can be done much farther in advance). Then the bottom finder predicted a 10:26 bottom. the market pretty well obeyed. This is a day where we looked for a bounce. Bottom finder showed the LOD at 10:32. per the call. Actual low came a couple minutes early at 10:30. After waiting a couple days for the midterms and the FOMC to be digested by the market, Friday the 9th was a “normal” trading day. So today we thought we would post an example of 2 different techniques. First, the Day Divination predicted a down day. A bit after the open an entry presented and a short call was made (red text). 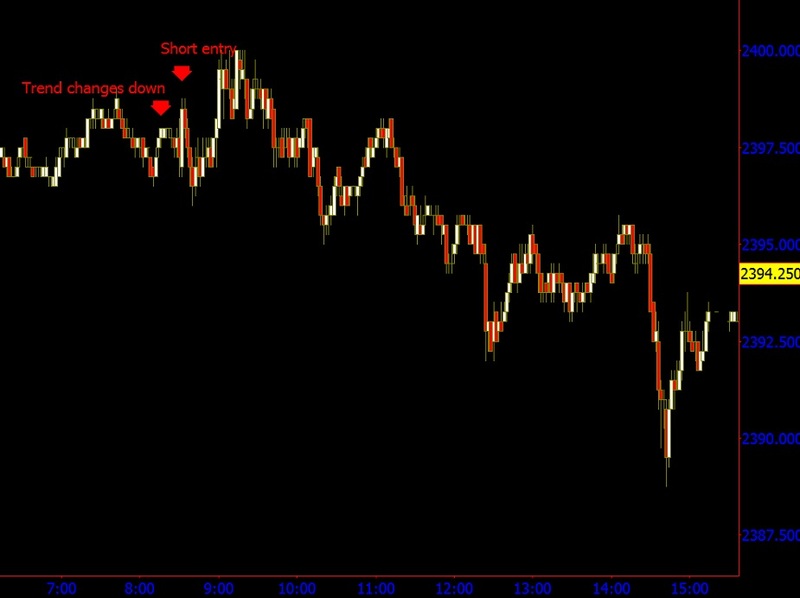 Second, the next call predicted far in a advance the exact time (off by a couple minutes) that the first pullback high would be to re-short. 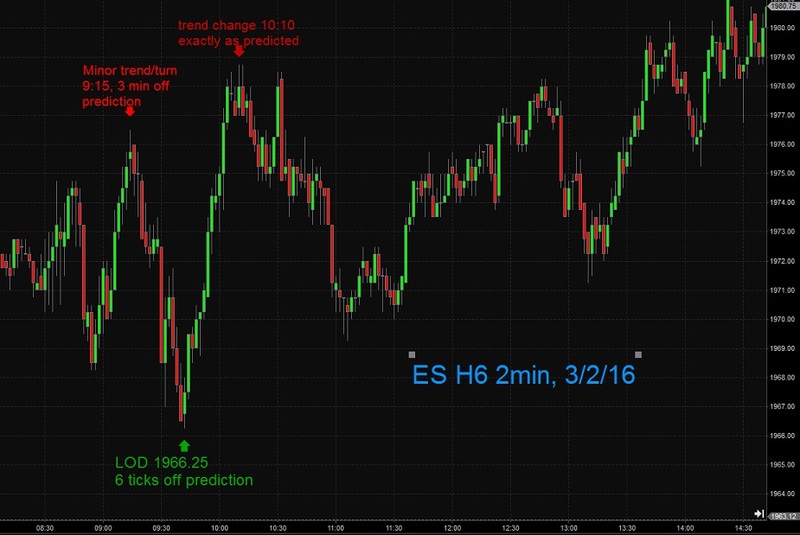 The call was made when the market was still headed down, and forecast the very future existence of a pullback. Here are more examples other than pure turn times. A couple calls on this day. 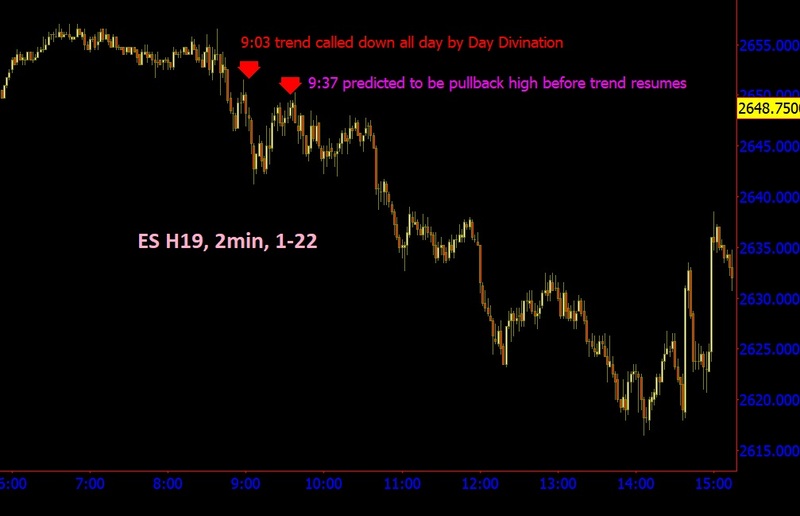 Our Day Divination read up day in advance, nut the market went up about 5 points off the open then careened downward. The call we made was when the market was down more than 5 points. 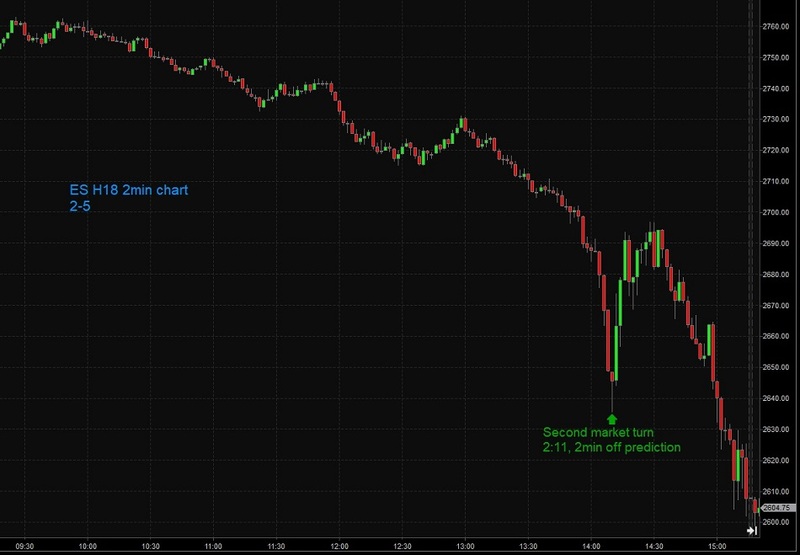 Similar to Gann’s famous wheat call, our expectation would be that the market would back up, cross the open, and ascend an equal amount that it was down at the time. It did just that. 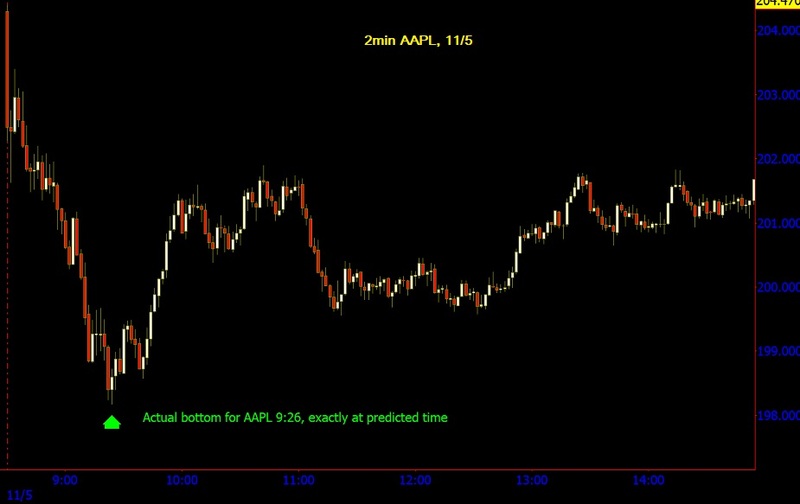 Then our top/bottom finder predicted the bottom on the huge AAPL drop to the minute, even though we made the prediction far in advance. We’ve had some people asking us to post some calls demonstrating techniques other than turn times. OK, so see below for an example of our Day Divination. It predicts in advance whether a day will be up, down, or neutral in advance of the day. Here, on November 2nd, the DD had predicted a down day so we got a short entry signal a few minutes after the open. If it seems that we haven’t been posting as many of these you are right. 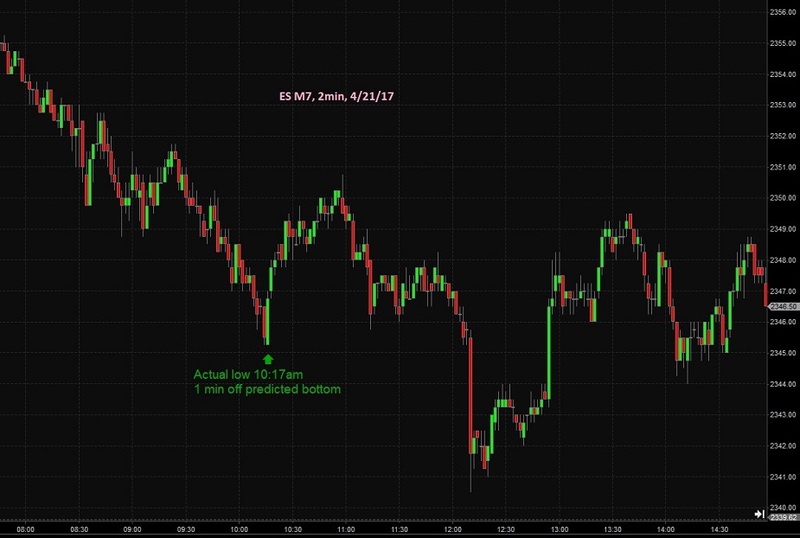 We are too afraid these top and bottom price calls may encourage top and bottom picking, which can be like a formula racing driver continually staying 4 inches off a wall at 280 mph. Anyway we had to put this one up. Today’s low price prediction below of 2697 on the $SPX was a multi-month low. We made this first thing in the morning when it looked like the markets were bouncing. Ordinarily we are within 1 point on intraday. But today a multi-month low was due, and the orb is about 15 points. 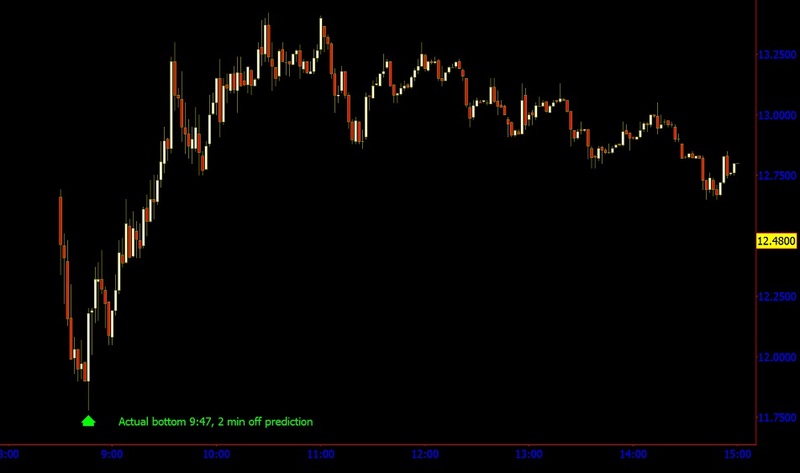 not to mention that it was quite unexpected this morning that the market would drop around 700 more down points. If this doesn’t hold as a bottom for the next few days, the market must drop another 100+ $SPX points until it hits certain monthly moving averages on the indexes. So the call below was on a larger timeframe but needed to occur today. This morning was obviously unusual. 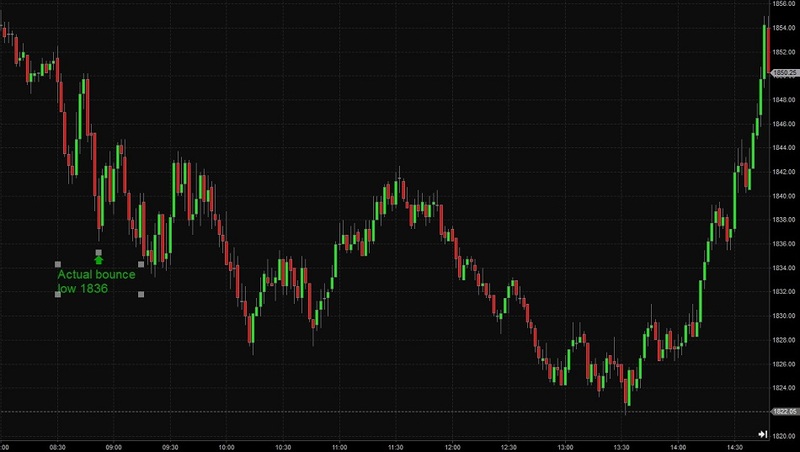 With the big gap down and Gann showing a turn time right at market open, the TICK extreme confirmed the bounce. Almost 12 points on the ES. Then we showed another low called for 2:13pm. This was 2 min off the big deluge. Now let me tell you what a nightmare trading that was. First, the ETFs are having a hard time in these markets due to the way they liquidate. 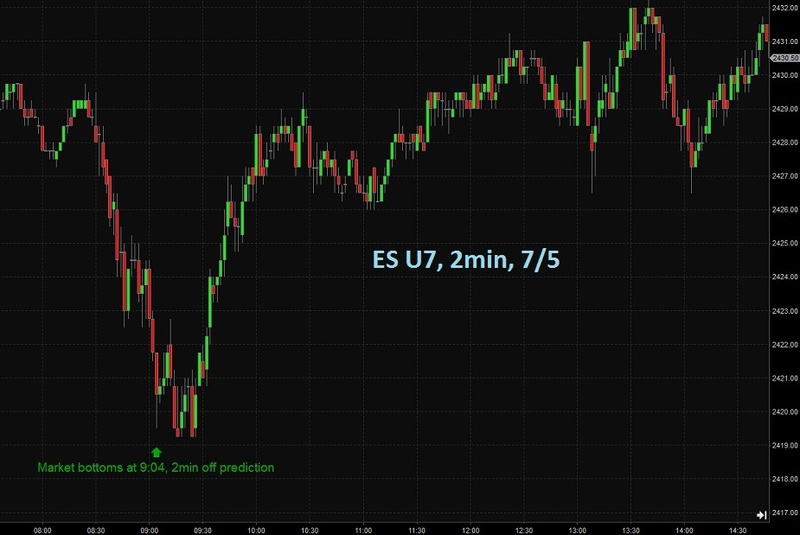 My quote screens on ES, SPY, and options were all flashing in and out. Managing to buy an assortment of options very close to the bottom, many actually remained the same price (to get out of) even though the ES was bouncing 70 points. More residual earnings announcements today with some nice juice for trading. 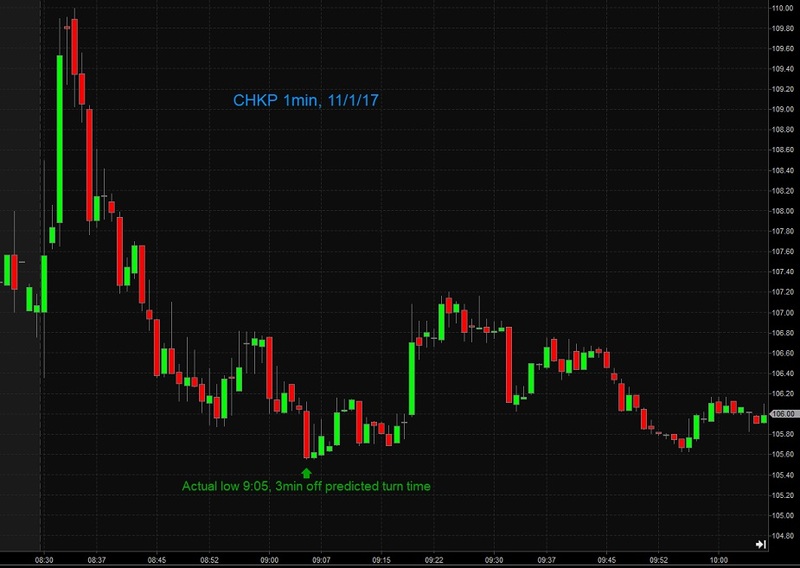 CHKP became hot enough to trade, sliding on bad news. 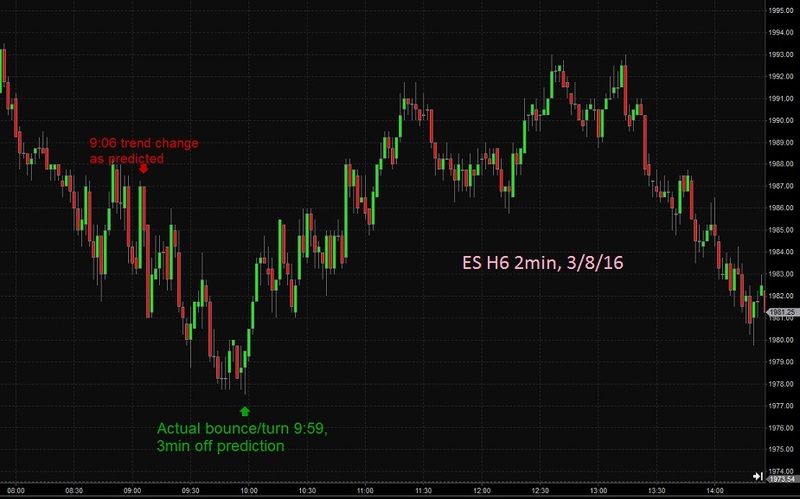 We predicted a bottom at 9:02, with the actual event happening at 9:05. Bounced over $1. Happy Halloween, and with earnings season peaking we actually have some volume on some stocks on news we can call. This morning QCOM was warning that their components may no longer be included in Iphones. It went into a distressed cliff slide. Gann precited the bottom at 9:12, with the actual bottom coming 4 minutes early, identified by a bullish engulfing bar with a pullback to follow for safer entry. The market was a little wobbly today, with some nice opportunities for bounces on distressed stocks. MCK had a bad run. See below. 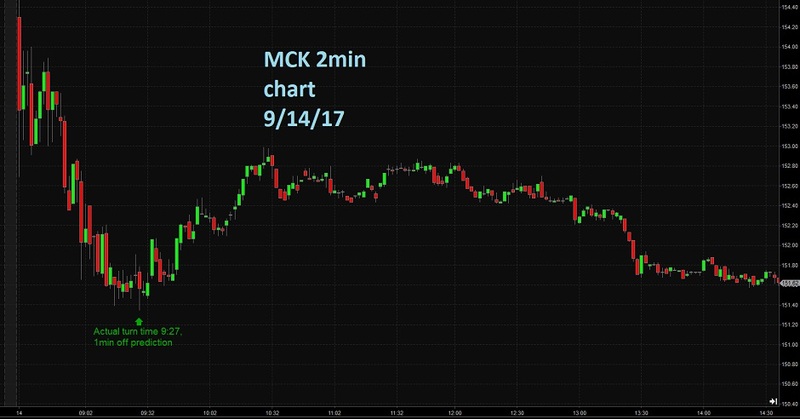 Several stocks did nothing and were stuck inside at their turns times, but MCK cooperated nicely. We’ve just returns from a sizeable consulting project and ready to hit the markets again. From the looks of things over the last couple week, we haven’t missed much. Today the market did as expected. 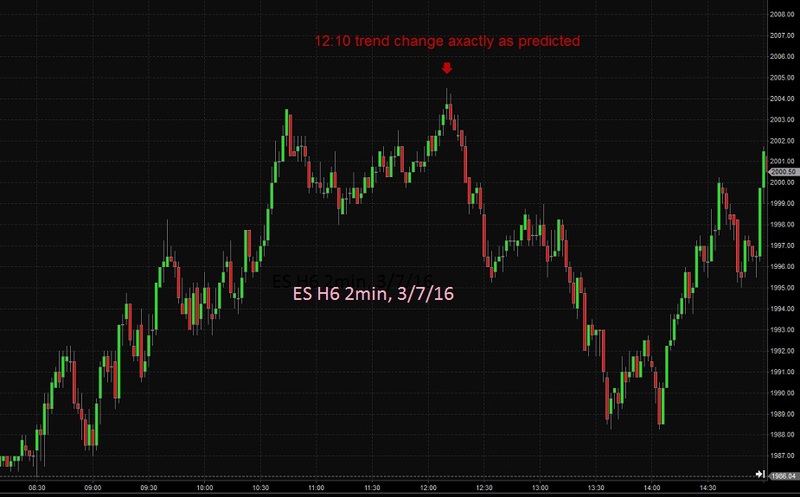 The Arcana trend of the ES was up. 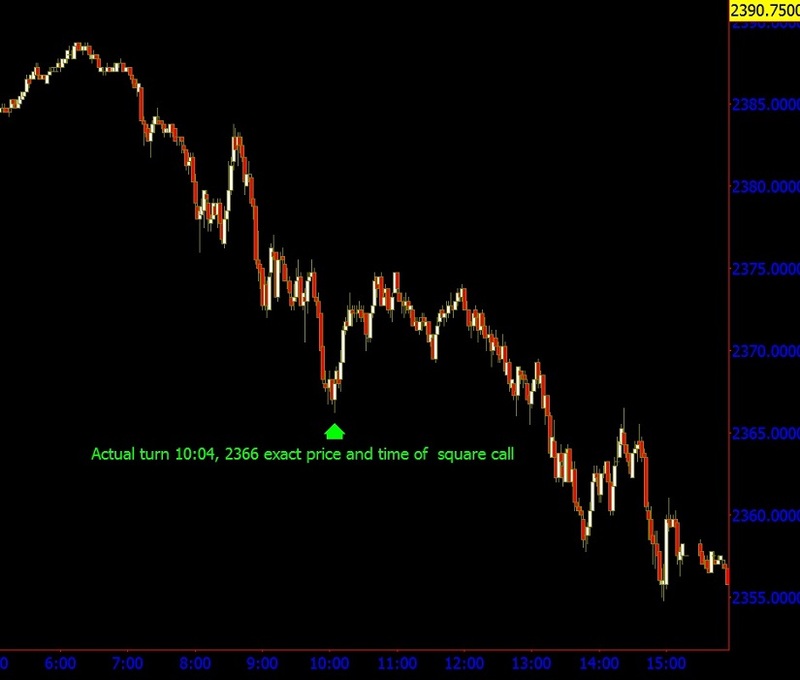 So it was a no brainer to find the turn time of the day and buy when the market fell into it. 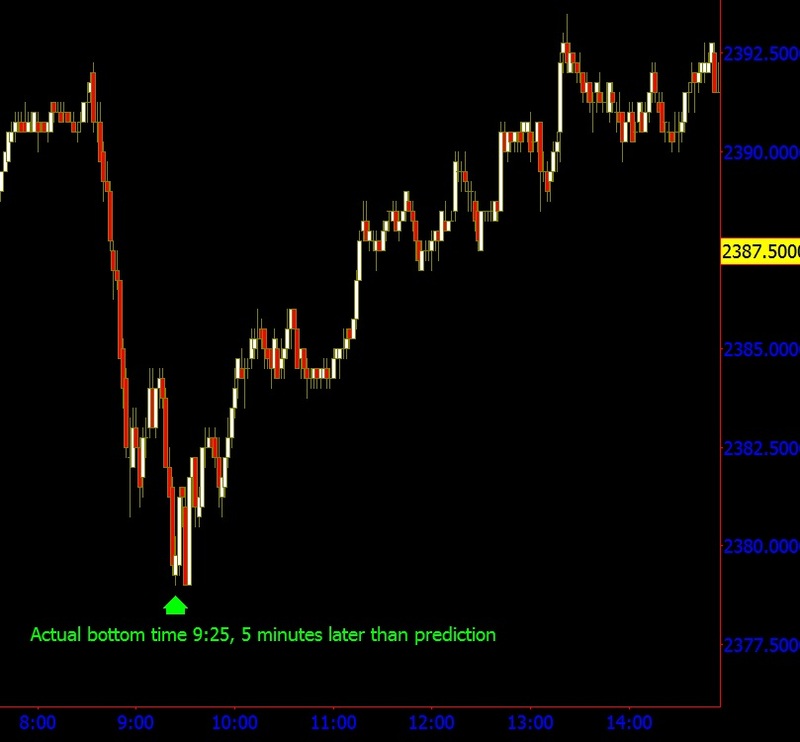 We do have a price expectation for the bottoms but don’t always show it. So here it is today below….within a tick. So when time and price lined up….perfect. 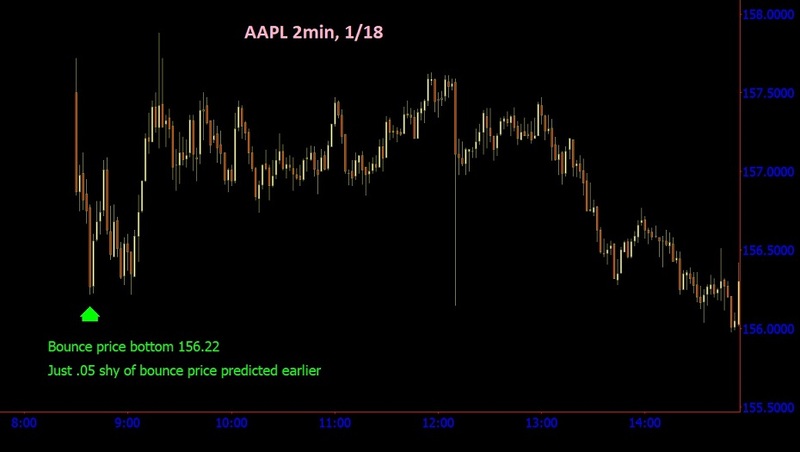 At 9am we were able to predict that AAPL would go straight down into its bottom price…which was just .03 off our prediction. 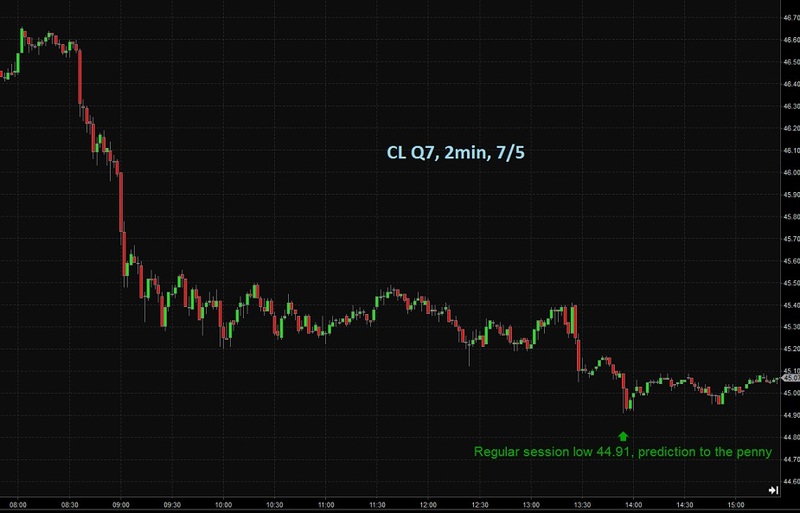 Crude hit our predicted low of the regular session to the penny. 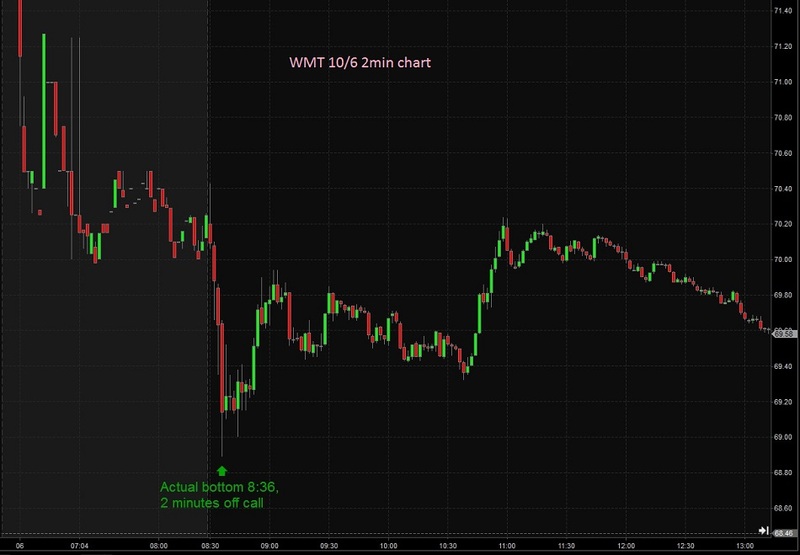 After staying out of the markets for the most part before the FED announcement, Friday was an awesome time to catch the bottom on WMT as a distressed stock. 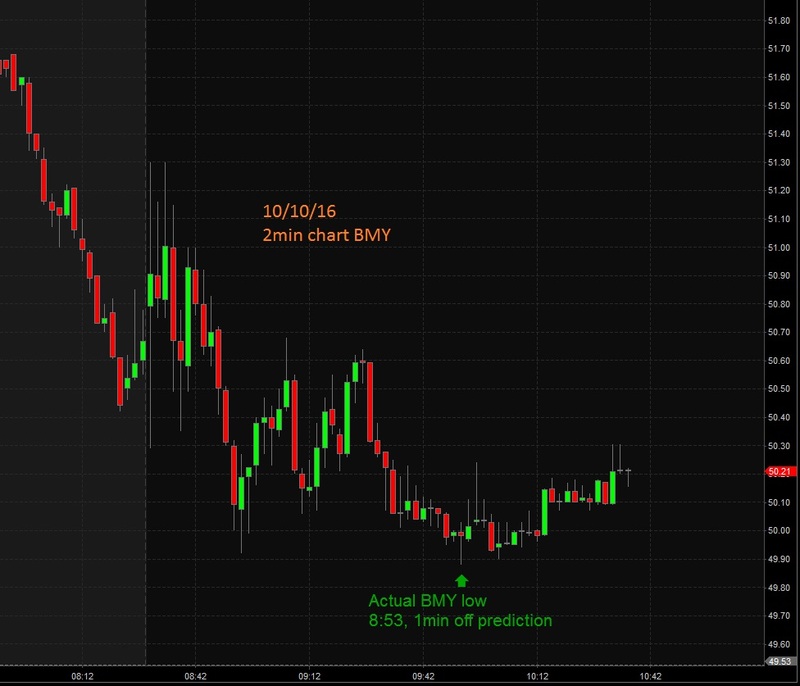 We had an exact bottom price projection and WMT fell and hit it in the first ten minutes. 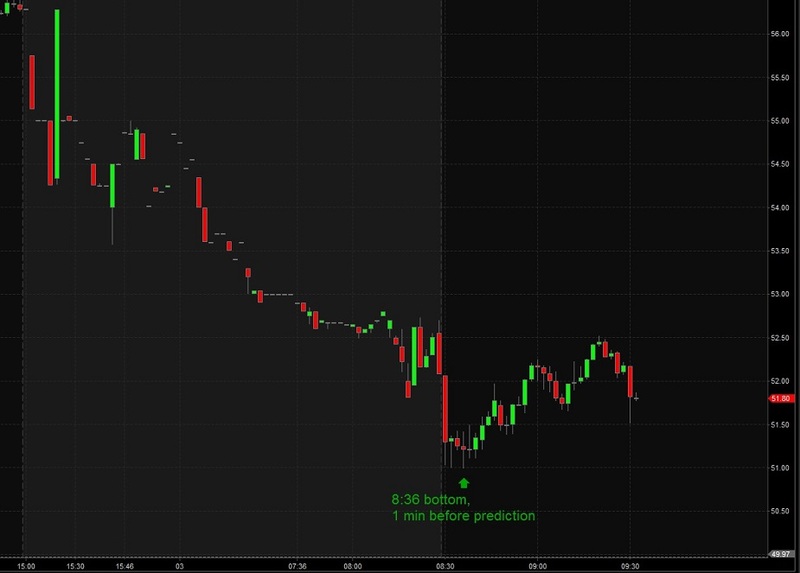 Our turn time was 8:40am CST, but on this day “price was ahead of time,” and we bought when the price target was hit just a few minutes ahead of the time prediction. We bought as the market fell a little under our target, and the bounce was well worth the effort. 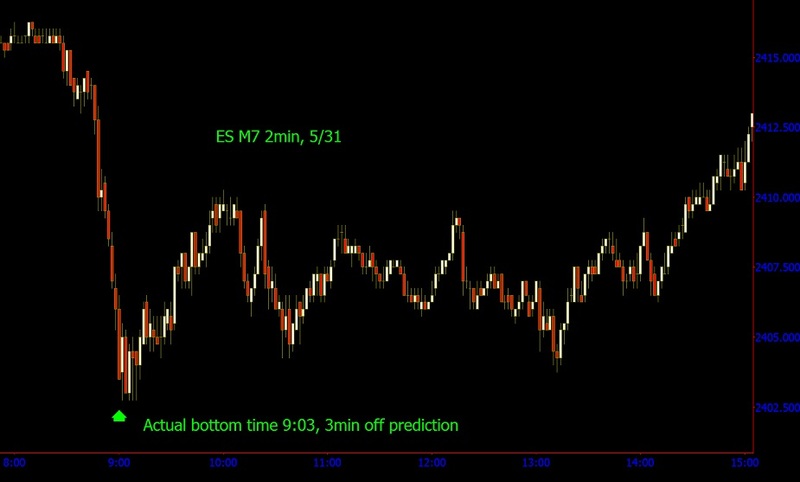 On this Thursday the ES was dead but we had some stocks gapping up on news and high vol that led to some predictable pullback times. See below for calls on JWN and BABA, the latter of which was a couple minutes off the turn time but predictably fell into a dynamic moving average that institutions use. That one we got and it bounced well over $1. The US Indexes are starting to dry up with a low $VIX. There were aq few stocks that were distressed on bad news with higher vol. AMBA was one that fell right into the turn time. Really nice bounce. Today started slow but DE was on fire. Gapped really high then pulled back. 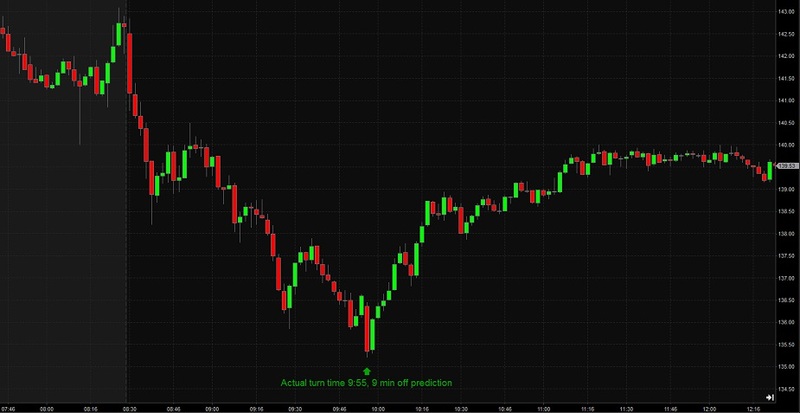 Using W. D. Gann’s ancient turn time method we were able to predict the pullback turn well in advance and just buy at that time, the stock promptly bounced a buck fifty before sinking again. Early On we knew there would be a US Index downdraft by the daily and weekly trend turning down. 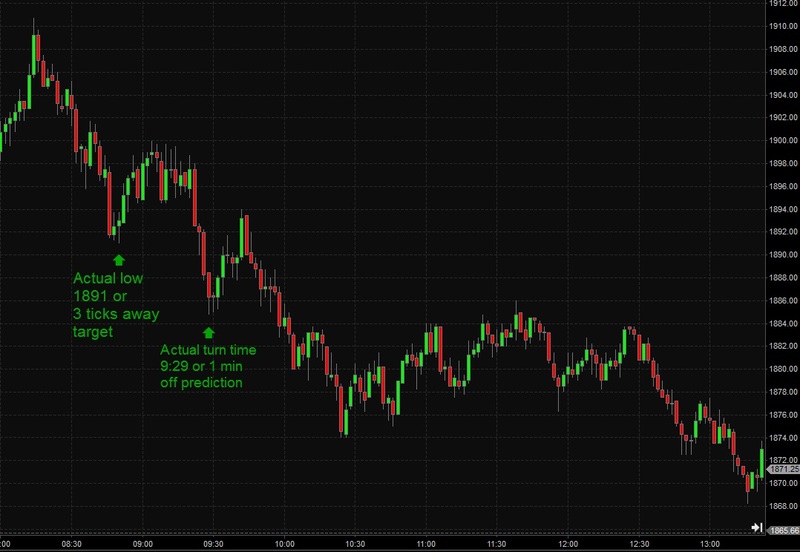 Knowing the bottom time well ahead of the actual event can be helpful, as you can see by the snapshots below. This market had some mom on this day. First, we were able to determine 2 turn times on stock JACK in advance. It kept going down the rest of the day, but not before some really healthy bounces. Remember we are mainly day traders in practice. 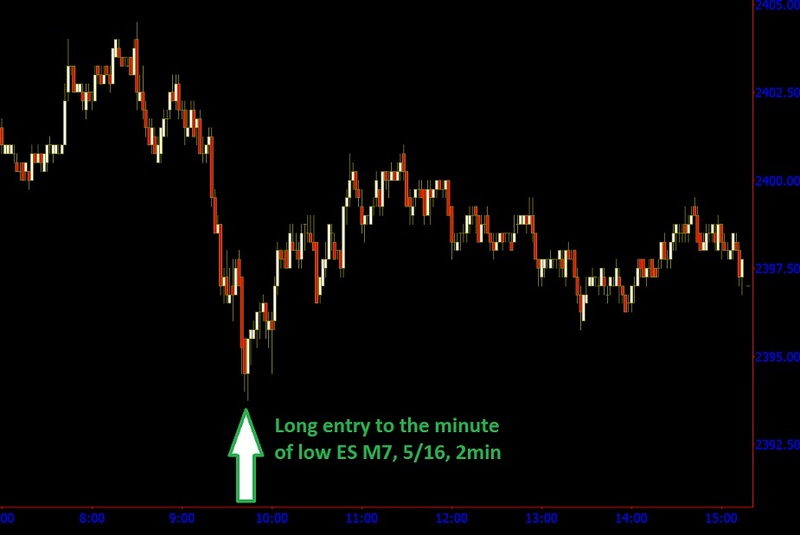 And of course we were able to call the main turn in the ES in advance. Same thing- down all day but not before a meaty bounce. This day started as an up day then careened down right into our time-price target. Expecting the up bounce, we snagged the bottom on the head. We were too busy watching some of the stocks to call the market general in advance. See our HD call, getting the turn to the minute. 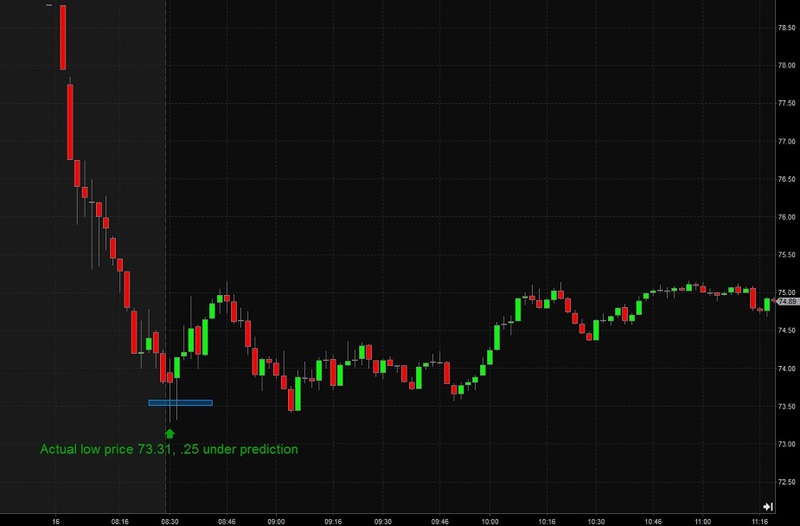 With the weekly trend turning up right before the market and the intraday trend mixed, we were hesitant to take the short. Instead we knew there would be a big bounce and by identifying Gann’s turn time, we were able to buy the bounce on the bottom. 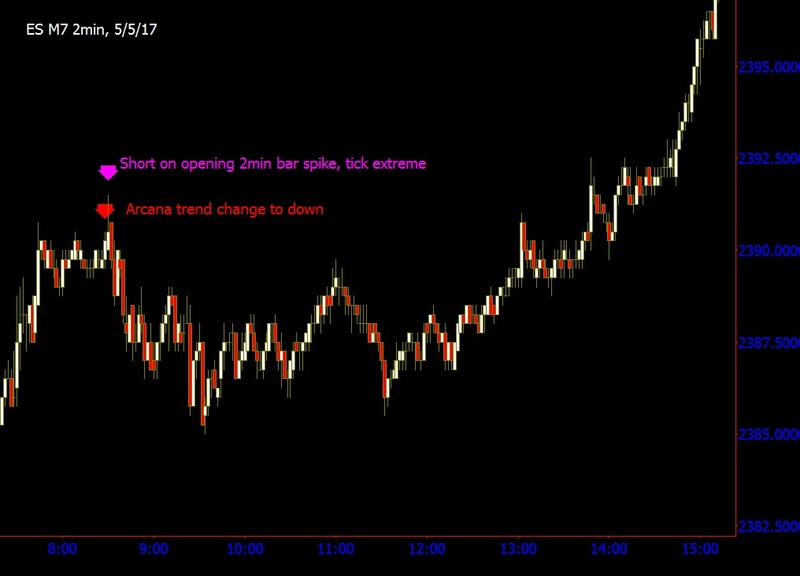 Both of the Arcana’s shot off down signals right before the market opened so we waited for a little spike before shorting. We were able to call the bottom of HTZ well in advance on bad earnings. It surpassed bounce expectations at almost $2 off the bottom. This was a great day for distressed stocks. With W. D. Gann’s turn times, each stocks vibrates to its own frequency, so you can forecast the turn of each one even though they may turn at different times, like CBI below. This morning the weekly Arcana changed the trend to down at about 8:24, or shortly before the open of the market. Then as the market opened the spike went up into a TICK extreme. We shorted there. This trend changes only lasts for a little over the hour. 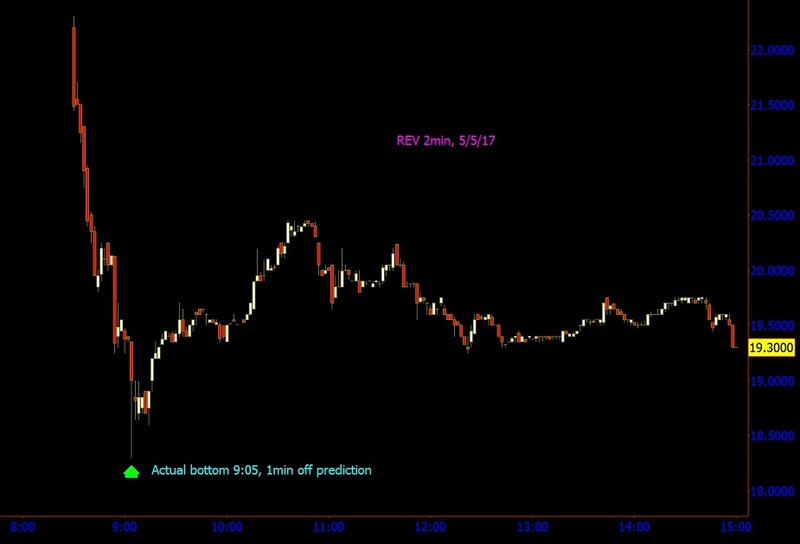 We were able to predict the exact bottom time for the stock REV. As we saw the price plunge into the flush spike at that time we just kept buying into it. The stock bounced over $2 off the bottom. 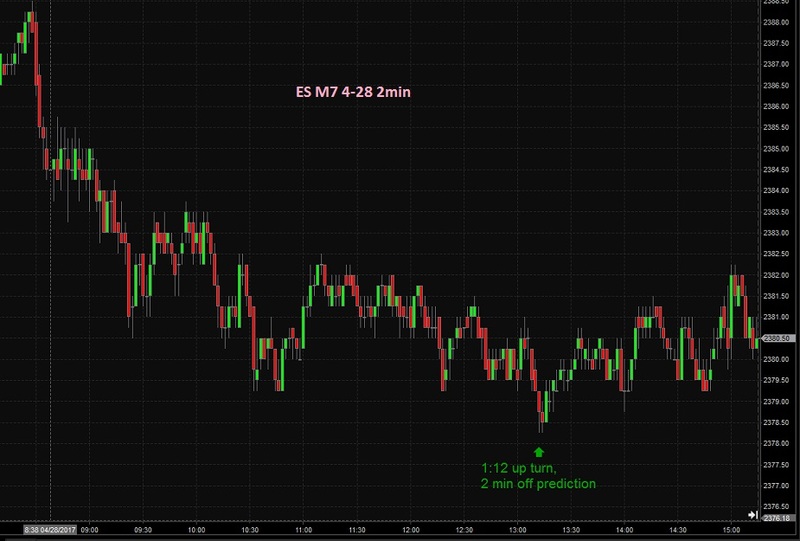 At the market open we were able to predict the time of the trend change with the Arcana. This means that the energy and direction of the momentum turns to UP. 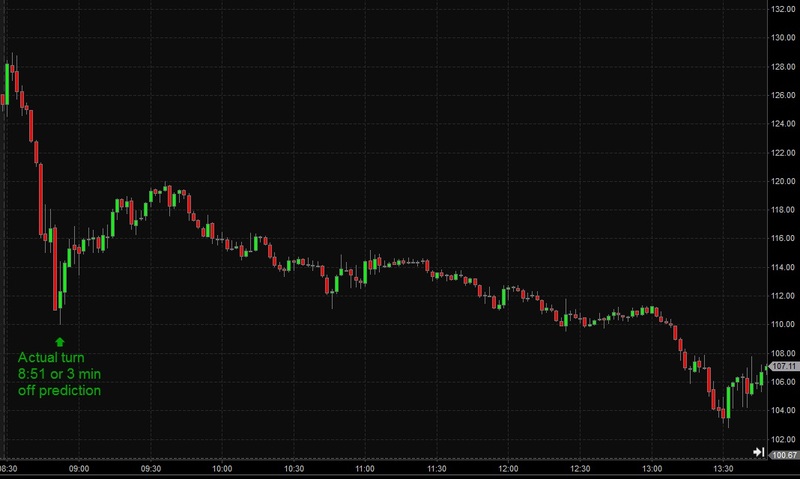 Notice that we bought the exact bottom a few minutes earlier….this was a price expectation that was met. This morning there were several distressed stocks. Most of this weeks we have ignored the major markets due to the FED announcement mid-week and so the focus here is on stocks with news. Most hovered in a “chop zone” except APC. Our Gann turn time found the quick bottom on APC. Though the stock pulled back after the climb, keep in mind on distressed stocks you want a $1 bounce at most. This was a Friday where the weekly and direction remained down and we rode out our shorts from earlier in the week. 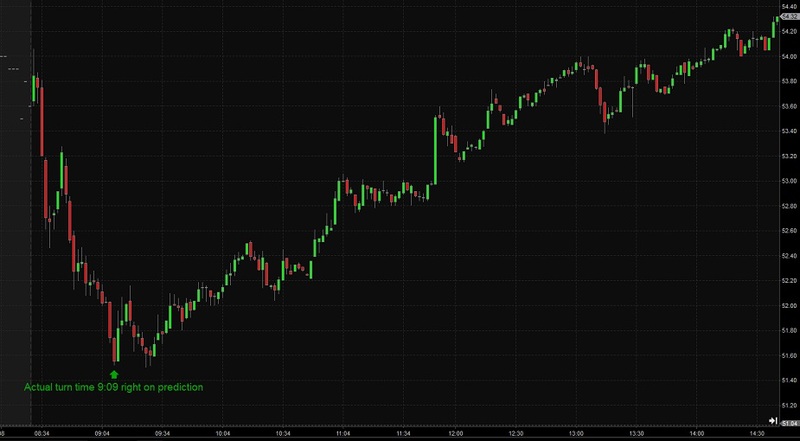 At 1:10 the trend changed to up, and the market nicely cooperated. As you can see we were able to predict this late-day turn at the beginning of the day. 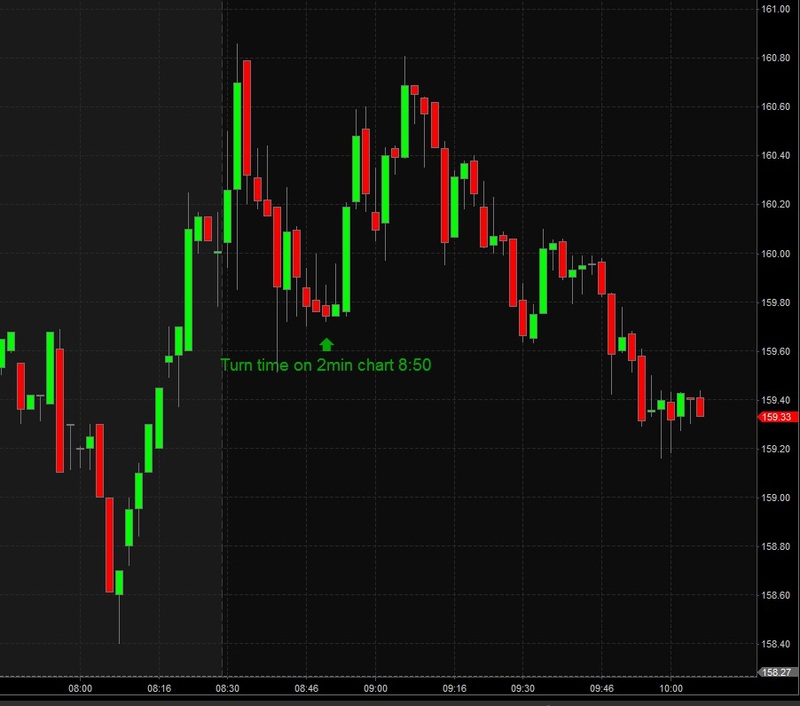 Below is an example of the trend change with Gann’s “Arcana” shown along with a turn time. The turn time is the exact crisp time of the peak. Many times this coordinates with the trend change, but, as you can see below, there are times where it does not. The Arcana trend forecasts the TREND. The turn is the entry. With the market gapping up on news, we were expecting an early pullback. Analyzing the market the evening before, we were able to know that the trend would turns up at 8:34am. The market was about 1 or 2 minutes late, so we bought even more! On this Friday the energy of the market was up for the week but down for the morning, lending itself to the expectation of a pretty good bounce. 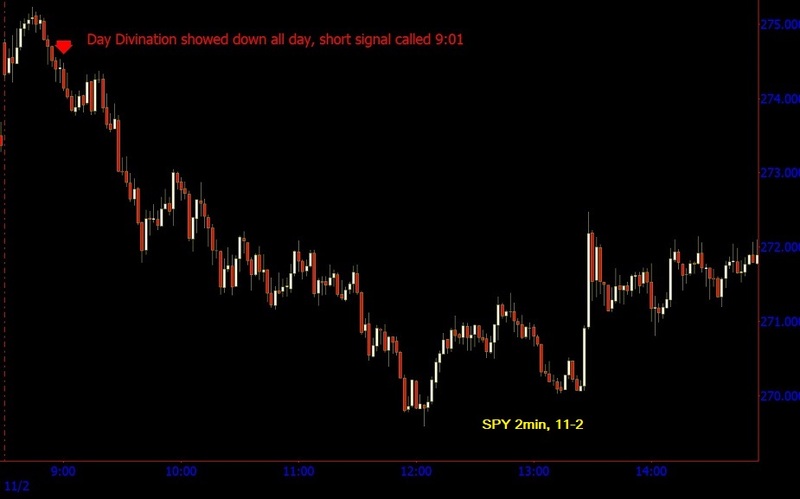 We called a 10:18am market bottom and the market was just off aby a minute. It did decline later, but not before a 5 point bounce to the upside. This morning there were a few stocks in play. 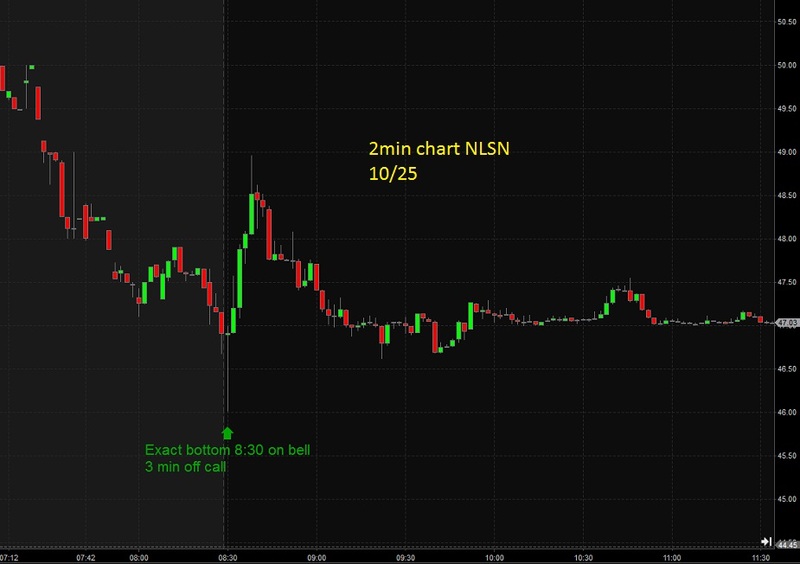 SONC and NLSN were highly liquid and making bottoming patterns before the bell. So from there we could use our simple Gann bottoming method and predict the bottom turns. 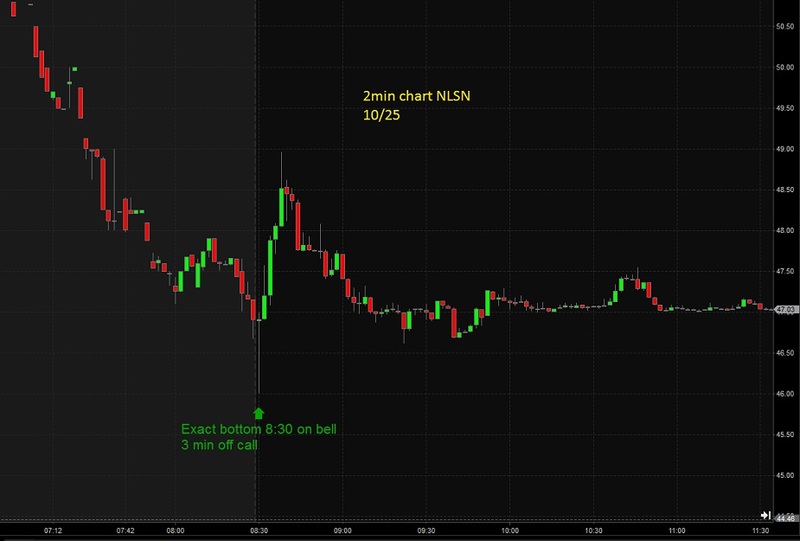 We got NLSN off the early time near the open, as even though the time for turn was a few minutes before the bell, this scenario is often materialized as a plunge off the bell. SONC we called to the minute. Our friend EBAY was in distress today. It turned right where Gann said it would. Not much on the bounce but when you gap far below support not a lot of buying interest from anyone. Today JNJ had some bad news and we assumed a bounce at the Gann price and time square out. Time alone was all that was necessary though. Today BMY had some bad news and slid into the mud. Again, we use Gann turn times to now when the bottom will hit. Today WMT had bad news and slid pretty bad. When a stock like WMT which has huge institutional ownership takes this bad of a dive, there is almost always a bounce. 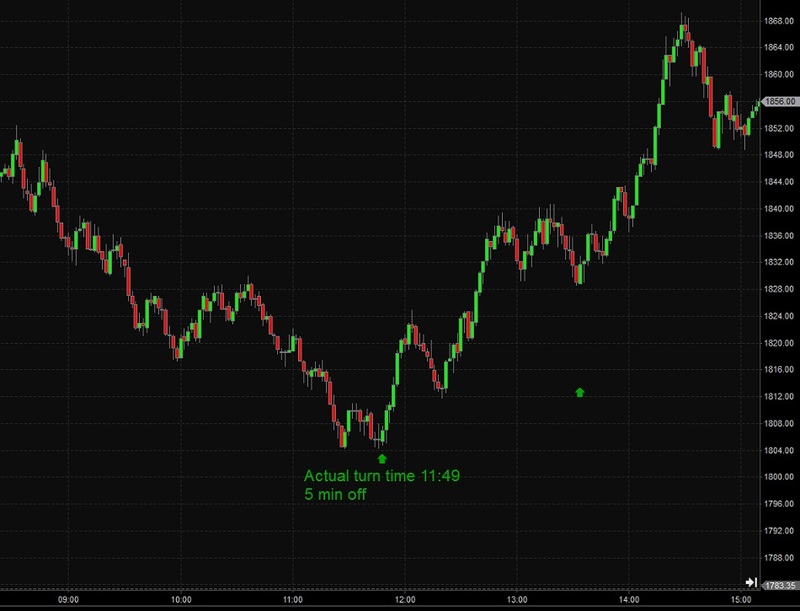 So we used our Gann turn time to predict the turn point. Pretty nice bottom ensued. Today Gann’s “Arcana” Trend Machine was the ticket to an unobvious bottom. We knew from the Day Divination that the overall trend of the day was up…but when? it had crept down the whole morning, but because of the foreknowledge of the market’s cause we knew it was bound to turn up. That’s where the Arcana comes in. This is what is so remarkable about the trading methods of W. D. Gann that cannot be done with any other trading techniques. Gann’s methods are not based on market data. 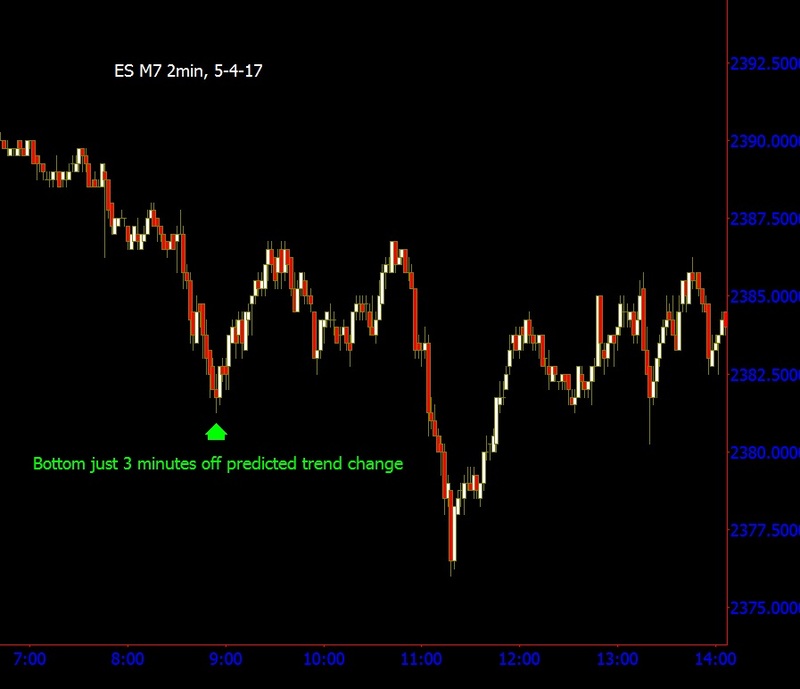 This morning we were able to predict the change in trend to within 9 minutes of a complete and sustained reversal in the market on the ES. See below for call and chart. 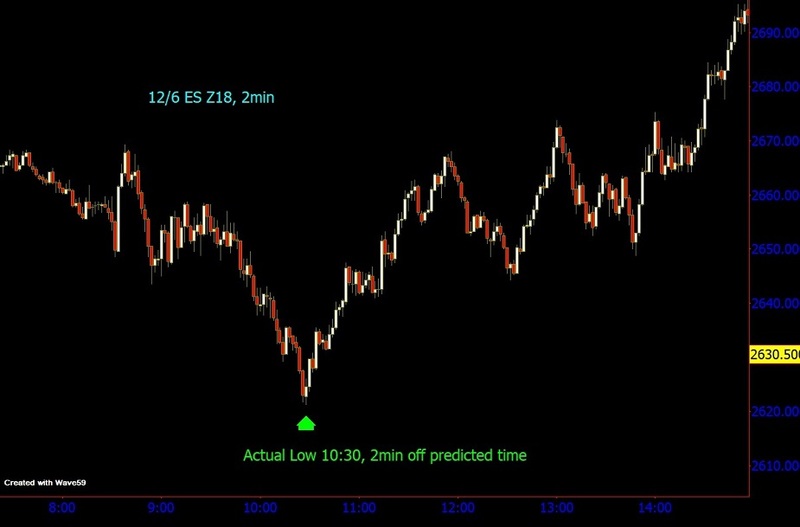 Below is an example of W. D. Gann’s “Arcana” trend machine in action. 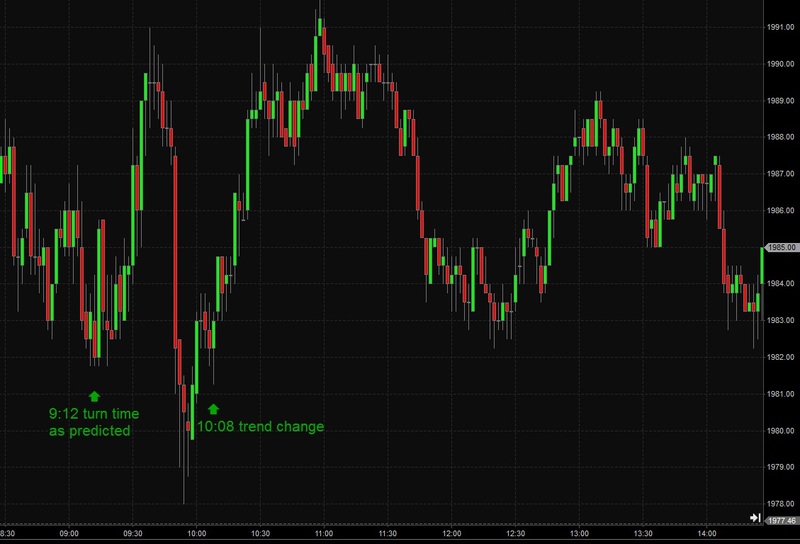 The trend change coincided with a turn time as the market plummeted to a new low. 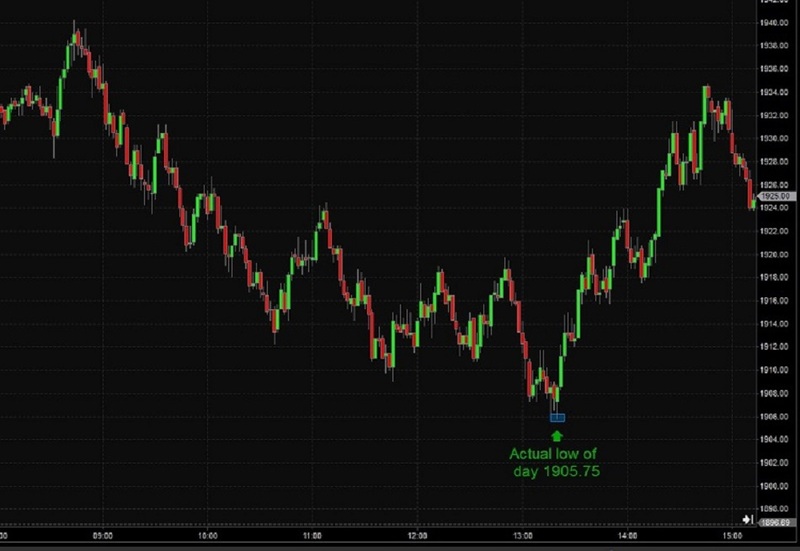 We knew in advance that the market was supposed to turn up, so we entered at the exact low/LOD turn time and the market climbed over 100 ticks. Day trading equities is a specialty of ours, going back decades. 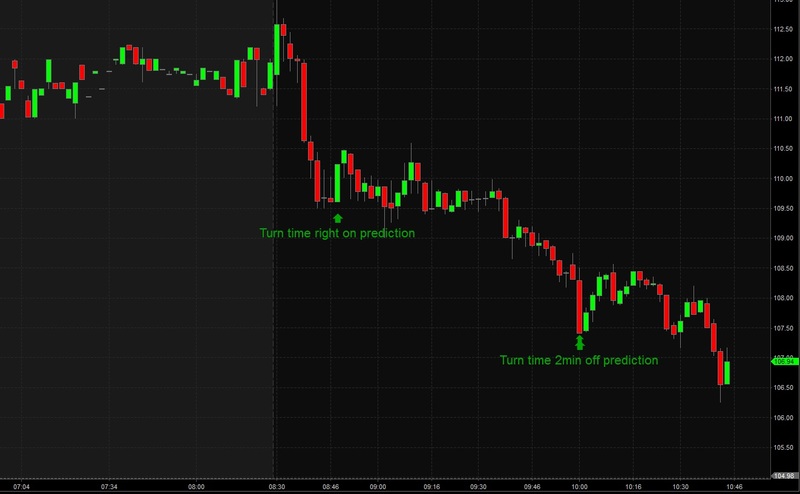 We like to mix Gann turn times and low times into decade-old strategies for pinpoint accuracy. DE was distressed today due to some bad news. With the law of vibration, we not only get the exact time DE will bounce or bottom, but the exact price to buy at. On this buy, we also waited a couple more minutes after bottom for confirmation from market. 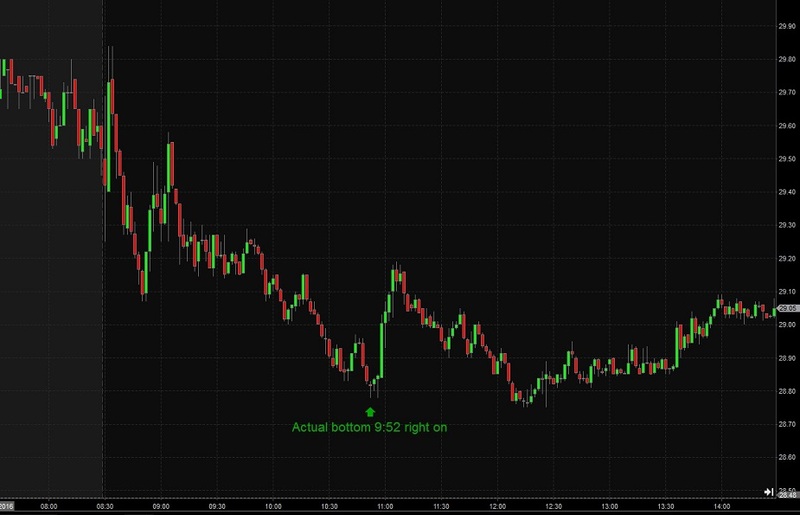 Though DE eventually continued down toward the end of the day for a new bottom, we enjoyed a bounce of almost $1. See below for call, account order, and chart showing we bought within pennies of bottom. Pretty simple today. Predict the bottom exactly. With the $VIX up we have better movement. See below. 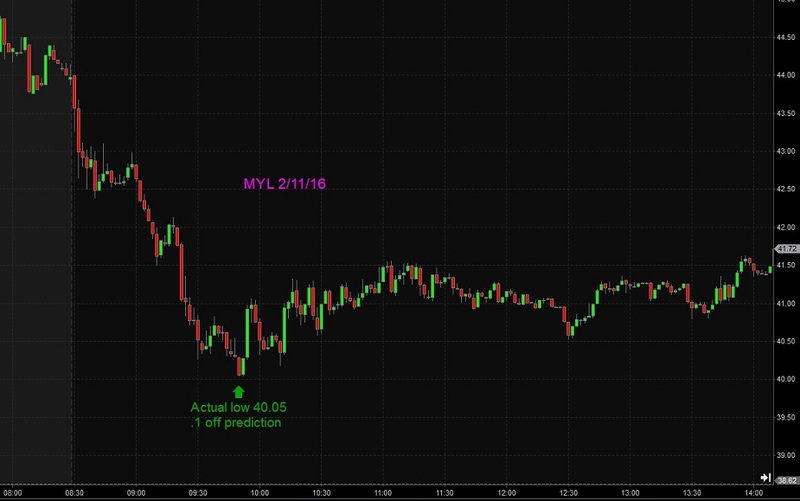 Take a close look at our calls and chart on this day because we rarely post all of our calls so some idiot doesn’t try to reverse engineer what we are doing and end up losing money. Several people interested in filling the last slot for our upcoming “W. 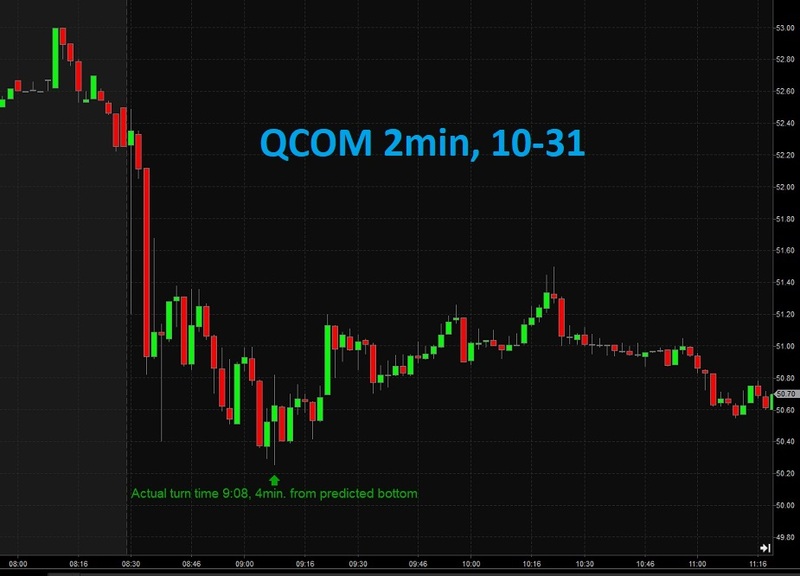 D. Gann: Magic In The Markets” Seminar requested that we post all of our calls today. So here they are…price, turns, and both Arcana trend changes. More bouncy chop as we consolidate before this leg ends. 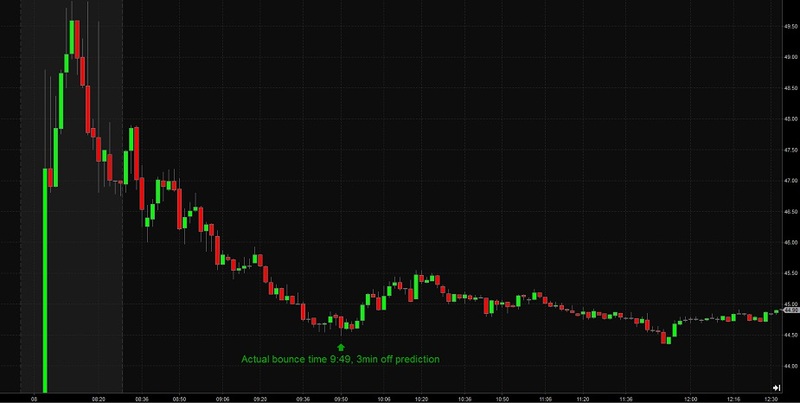 We were able to predict the first big and then the market turned back up within minutes of our predicted trend change with Arcana. Today was pretty good for a Monday. 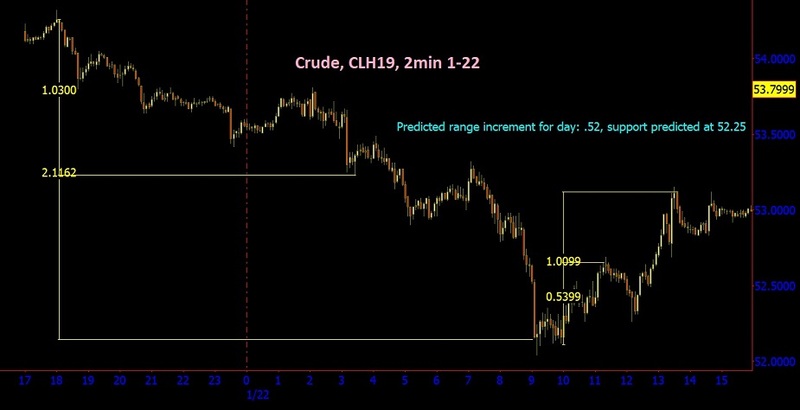 The trend was up since before the market open at 8:30am CST so we were able to catch a ride until the trend change right at our prediction time. Arcana. 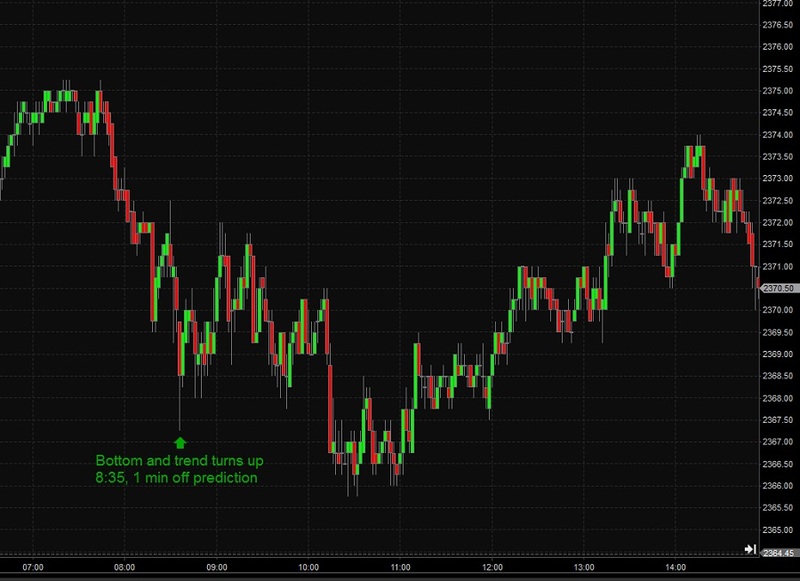 The trend changed early to chop-down, so we caught the bounce within a couple minutes of our predicted turn time. Today was another consolidation day starting on low volume. 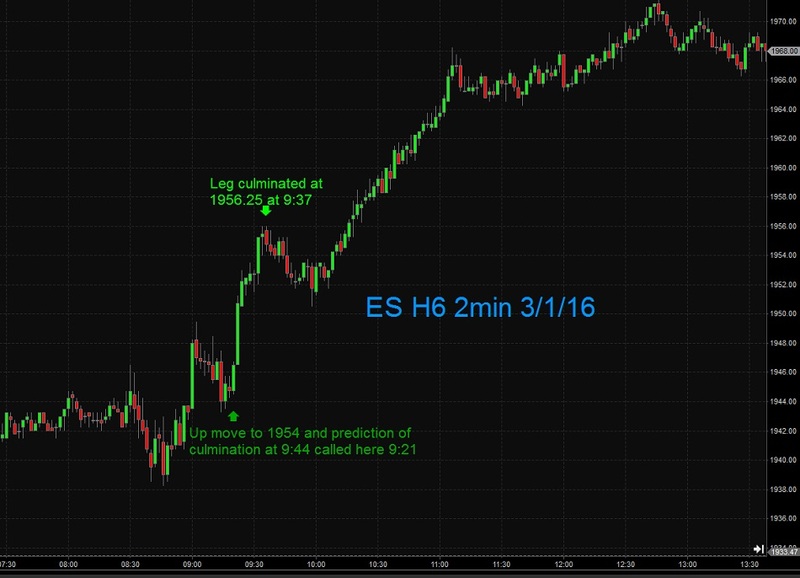 We were able to predict trend, turn, and price to within 4 ticks and 1 minute on the ES H6. What a bounce that followed! 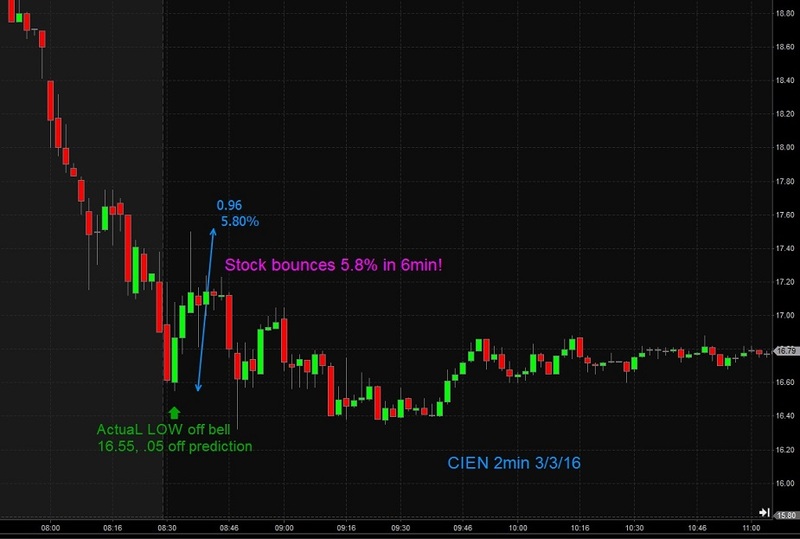 As a bonus we were able to get a quick opening bottom on CIEN by predicting the exact low off open, which was also within .15 of the LOD. Today was a consolidation day after the big run, so we were expecting smaller moves and targets. With W. D. Gann’s “Trend Machine” we were able to find the top of the main leg to the minute and the change in trend. 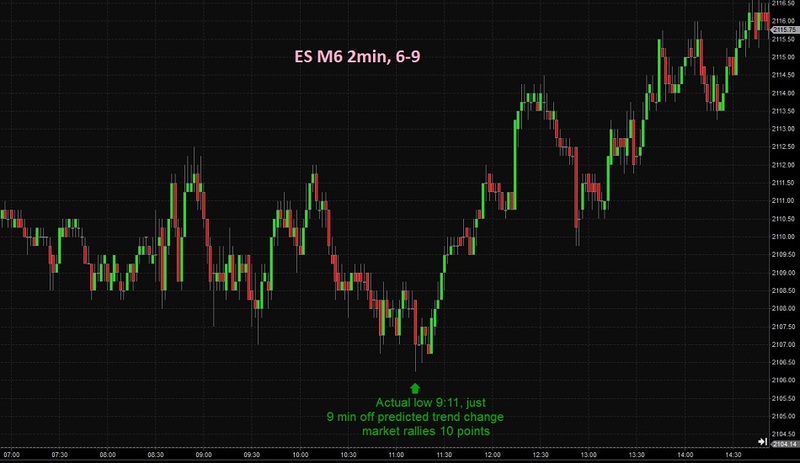 And then the minor trend change that accounted for about 10 ES pts within 3 minutes. 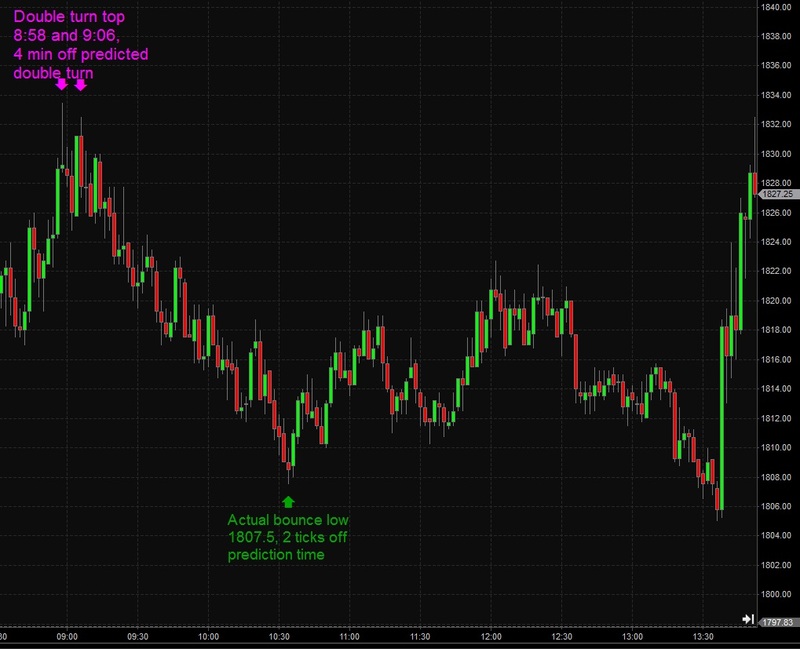 We also got within 6 ticks of the LOD on the low prediction. 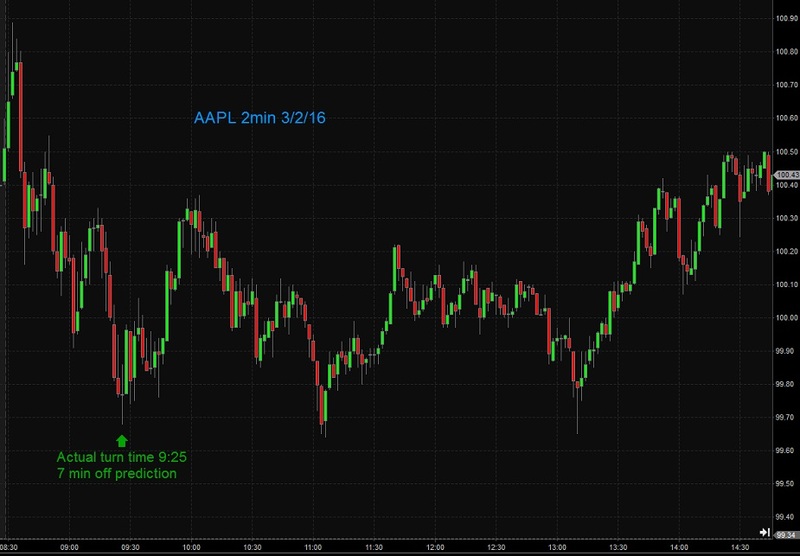 Then AAPL was back, and we were able to find the bottom turn time within 8min. 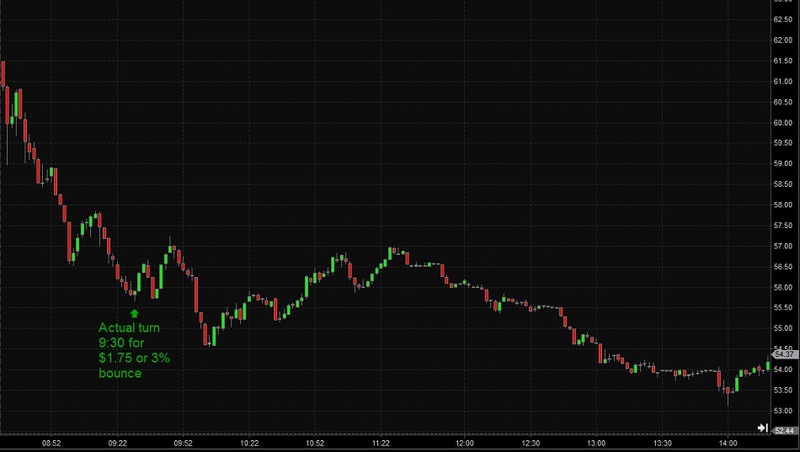 We recently had a loss in the family and this is the first real day back trading. we do have more time on our hands now so we are following more markets. The 1st of March started with a blowout up day that was clearly market manipulation connected to short covering. 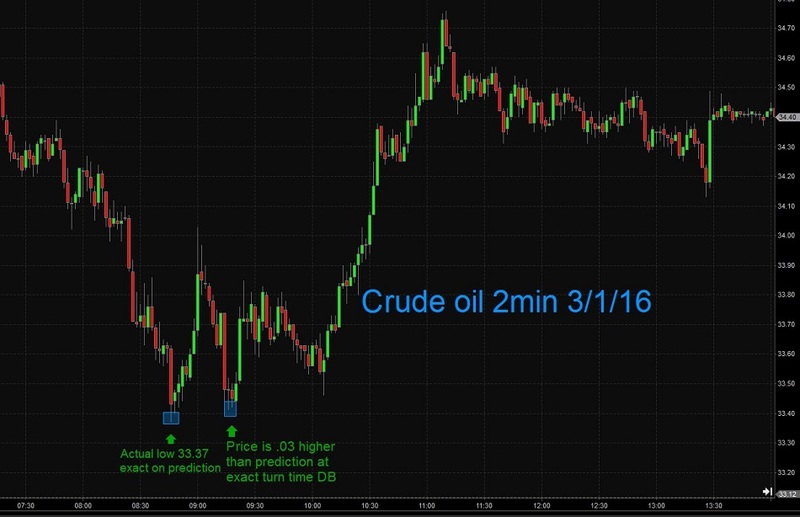 It gave us a predictable up leg on the indexes and some exact bottoms on gold and oil. This is a day we had as a down day. When it opened gap down huge we knew it would falter around, so we predicted the bounce and went with that at 1808. Apart from that there were some momentum stocks gapping down. One of these, MYL, looked appealing enough to predict a low on. Which was dead on. 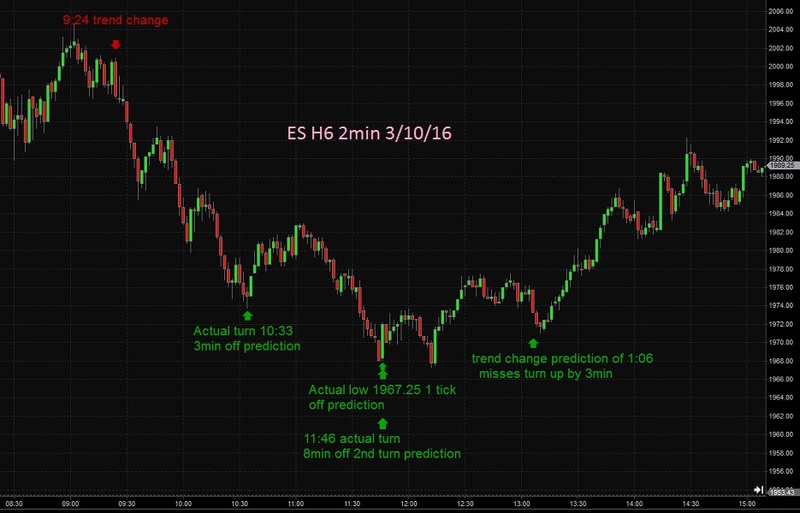 We had forecast a major turn right at the open on the ES, but the strength and magnitude was more than we expected. 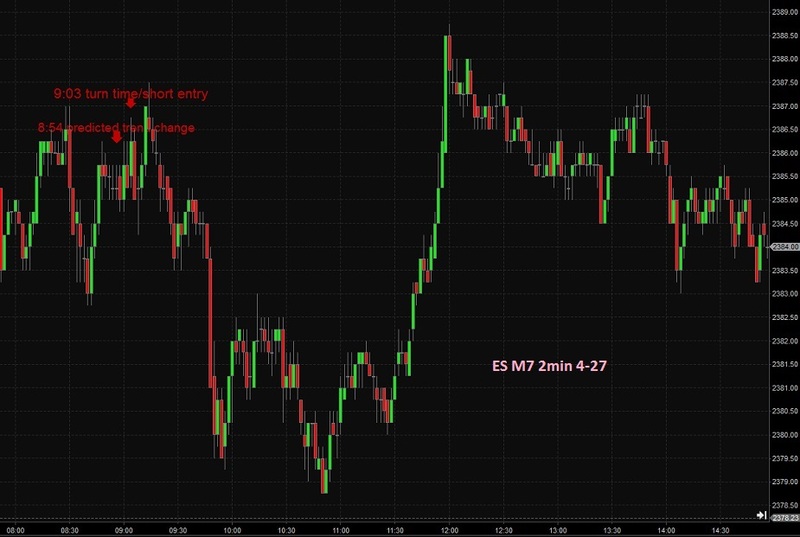 The ES chopped through a down signal and turned it into a no trade, so we looked for the first predictable bounce. Found one below for about 10 pts- enough to satisfy a daily profit goal. Looks like the down energy continues. 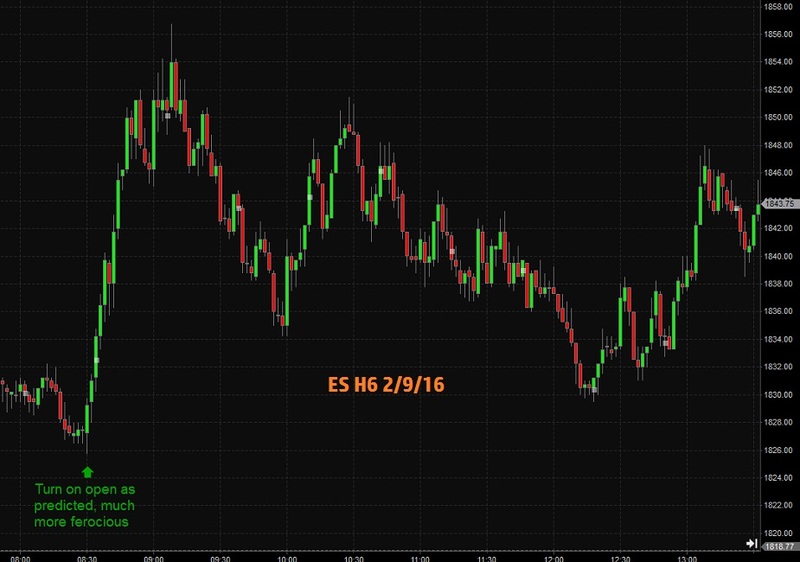 The strange earnings day produced a couple good bounces in the ES. LNKD got the hell hammered out of it. Down over 50% from the high. Knowing the exact time of the turn helps finding the bottom on this for a great bounce. WDAY got hammered in tandem with LNKD. It too had a very predictable bottom turn. Very strange market action today. Up massive, down, then up again. 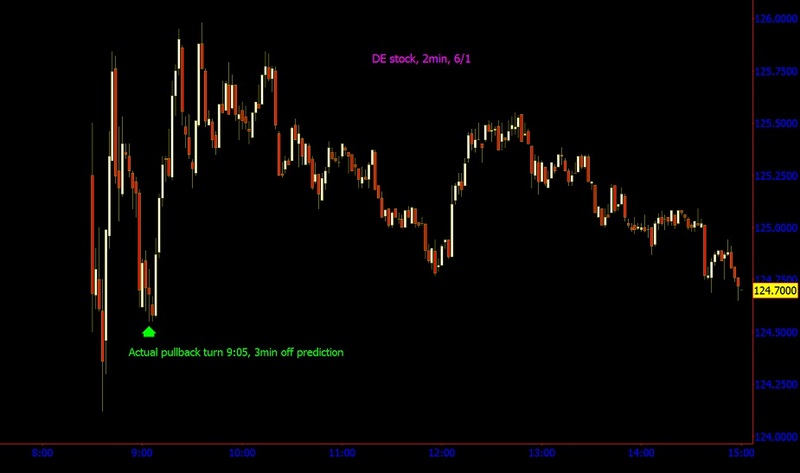 We were able to peg the LOD with an Gann’s alternative time prediction used when the volatility is off the charts. 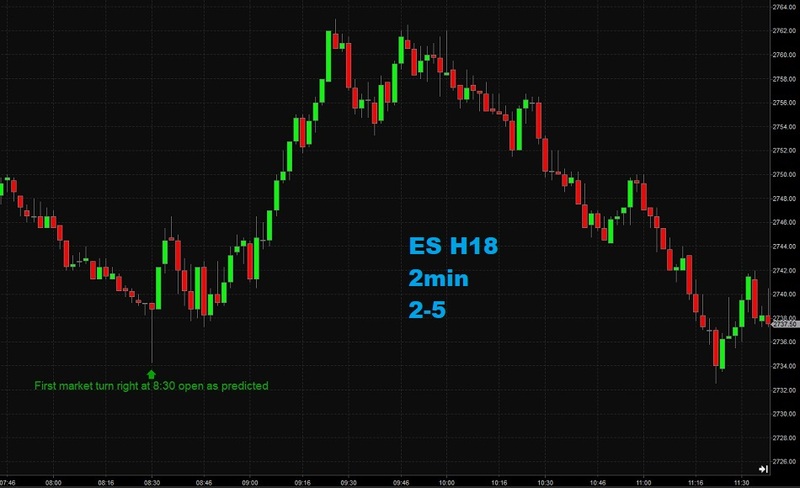 Looking closely at a 60min chart of the ES H6, you will find today’s low was actually a double bottom. 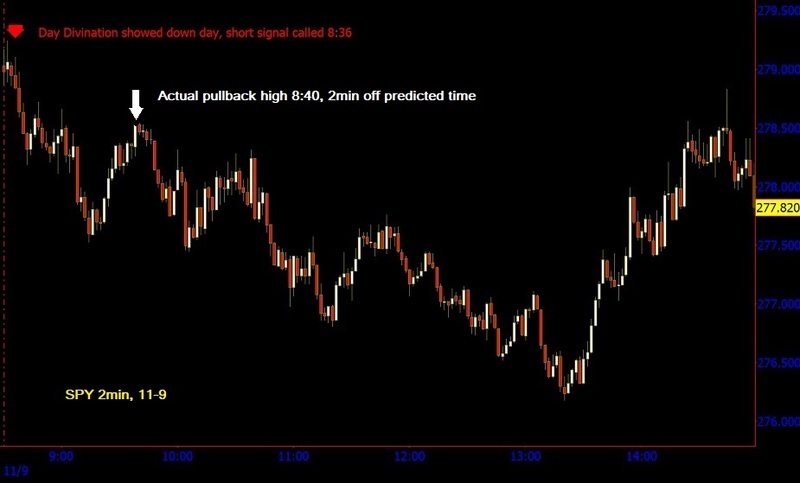 The slide from the massive pullback surge was greater than anticipated. This was a rare day where there were actually 3 turn times predicted. The first was 10min off, just at our margin of error. We were able to peg the LOD price to the tick. More good volatility on this day with decent moves and bounces. 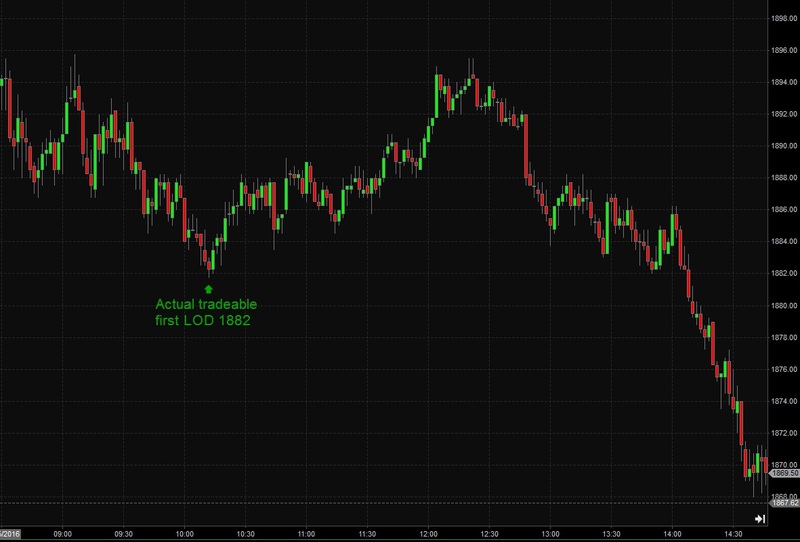 Our predicted low of 1883.25 was about 5 ticks off a vicious reversal pivot of the morning. While the market sold off and declined further in the afternoon, having a 10 point bounce is good enough. This was a huge reversal day. 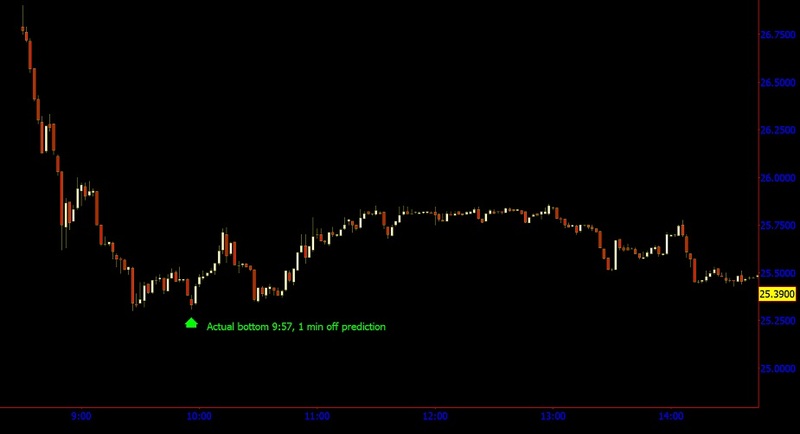 Our predicted turn/LOD time of 11:54 for a double/alt bottom provide to be within 5 minutes of the actual turn off the bottom. This was a huge gap down day. 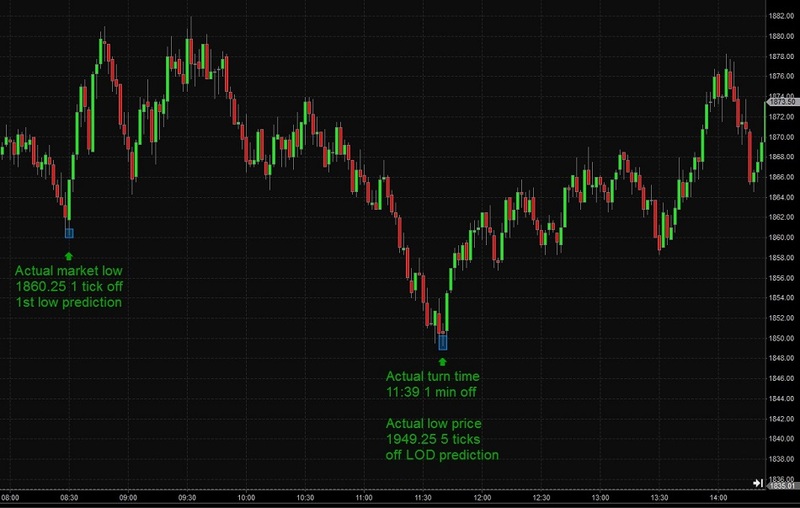 We called the immediate low of 1860 on the open and then the predicted turn time of 11:38 for LOD was off by about a minute, and the LOD price withing 5 ticks of the actual LOD. This was a great trading day. 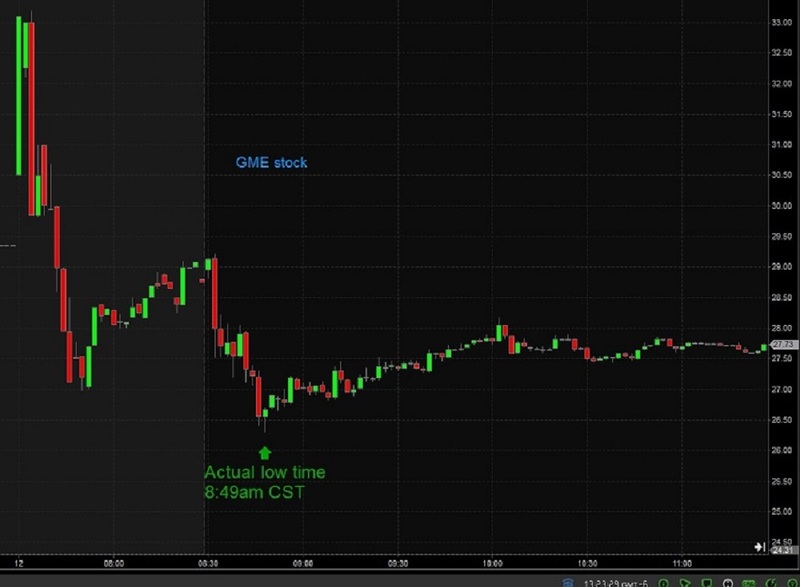 First, we predicted the Low of day TIME on GME before the stock opened. See Skype log below for reminder about 10 minutes before the predicted low/turn time. Actual low of day TIME/turn: 8:49, or 2 minutes off. 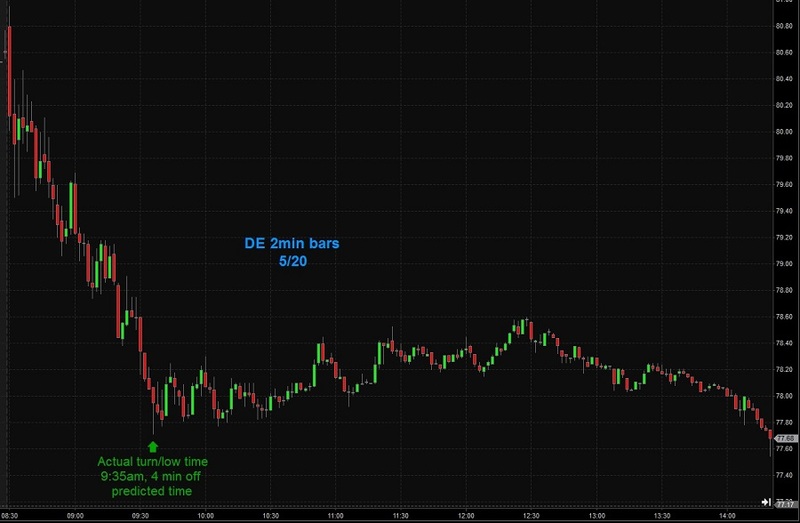 Next Skype log and chart below: Skype log reminder that the low of day PRICE on the ES would be 1905 minutes before it declined to that price. Actual low of day: 1905.75, or 3 ticks off. 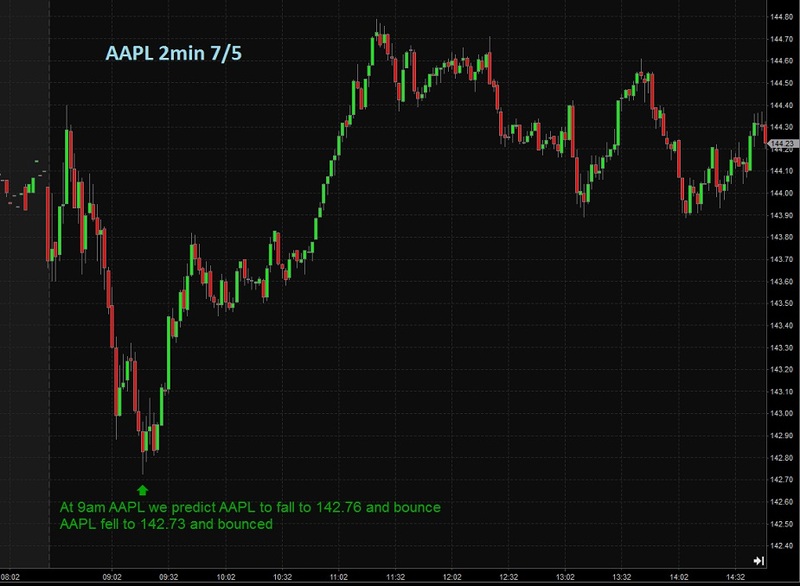 We were able to forecast the low on AAPL well before it hit there. See chart- AAPL adhered to this low of day all day long.